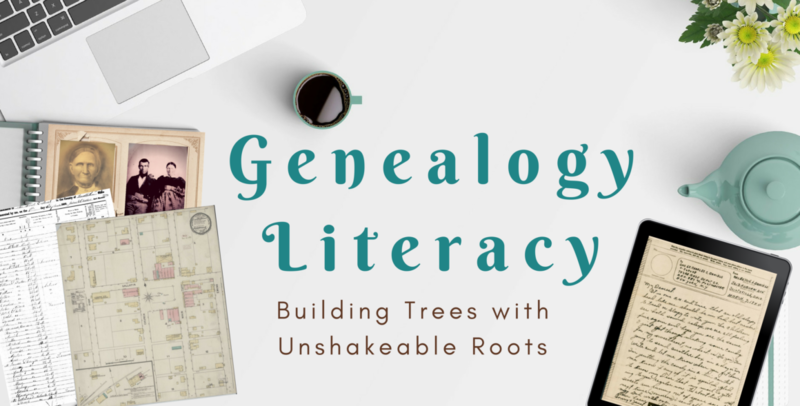 Genealogy Literacy - Building Trees with Unshakeable Roots! 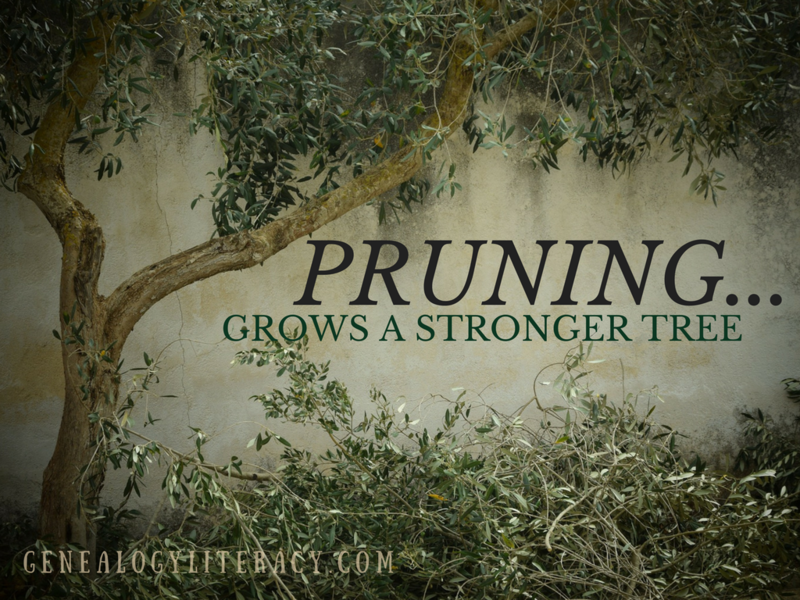 Building Trees with Unshakeable Roots! Reflecting back on 2018, I’m happy to report that I accomplished a lot more over the course of the year than was conceptualized at its inception. This is not to brag, but rather, a revelation when considering the beginning of a new year. 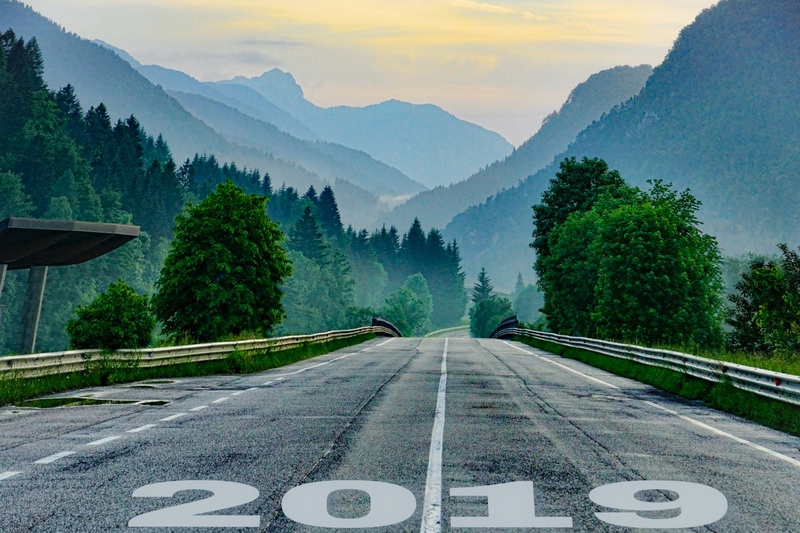 I have come to the conclusion that it is much healthier to identify our successful changes of the previous year, and look for opportunities to expand growth, instead of identifying areas of failure that need to be altered. 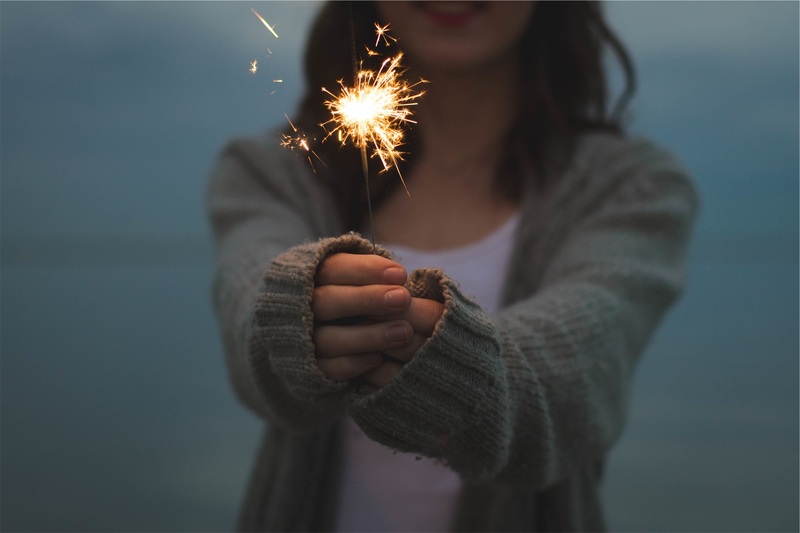 In other words, we have a tendency to issue resolutions as declarations that are inflexible and too finite to encourage success. Which, in the long run, spells out our defeat even before we begin. 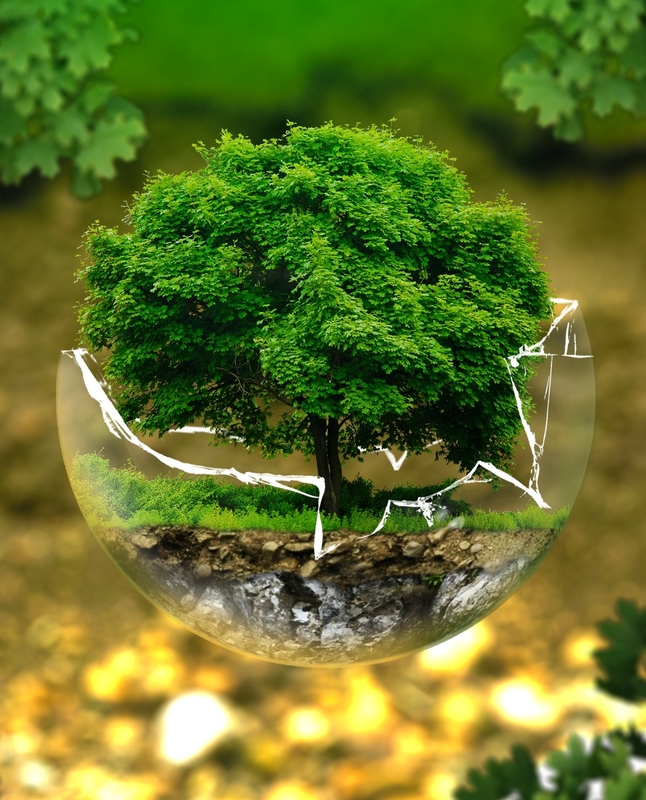 If we, instead, look for hopeful themes to help or encourage our growth, then this should be enough to elicit positive change over the course of a long 12 months. 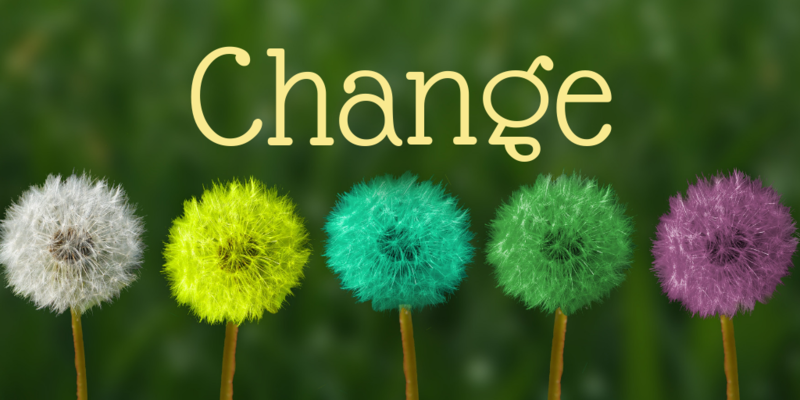 When looking at the growth of 2018, there was no resolution to drive the change, but an openness all year to identify areas susceptible to change, which were actually within my power to change. I knew a healthier lifestyle was priority one, but instead of hitting the gym like a crazed fitness junkie, I started taking walks every day as the weather permitted, and making better food choices consistently. I lost almost 20 pounds, gradually, and even with the weather change, I have not gained anything back, and will gently continue my efforts to get out more, and look for opportunities to enhance this healthy alteration; Being gentle with myself, and not harsh when I take a break or indulge in a guilty treat – celebrating by encouraging myself to continue the good work, instead of internally chastising for a missed step. This approach is also a good rule of thumb concerning our research efforts – be gentle with ourselves, and celebrate our accomplishments along the way. Another area that caught my attention in 2018 was the amount of clutter in my home. 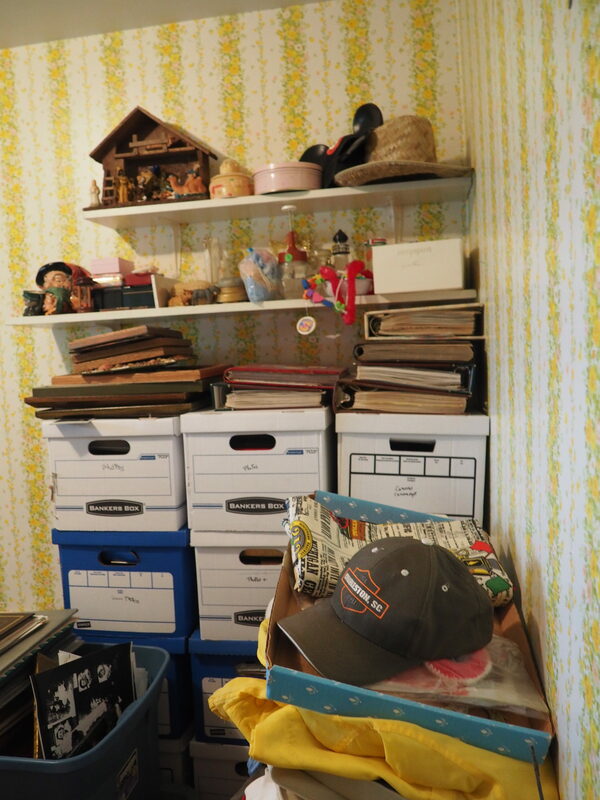 With each house cleaning session, I made a point to throw away or remove via donation, a small amount of items which held no further meaning, neither intrinsic nor sentimental. Over the course of the year, I made 5 carload trips to Goodwill, and disposed of 7 large trash bags of paper junk. 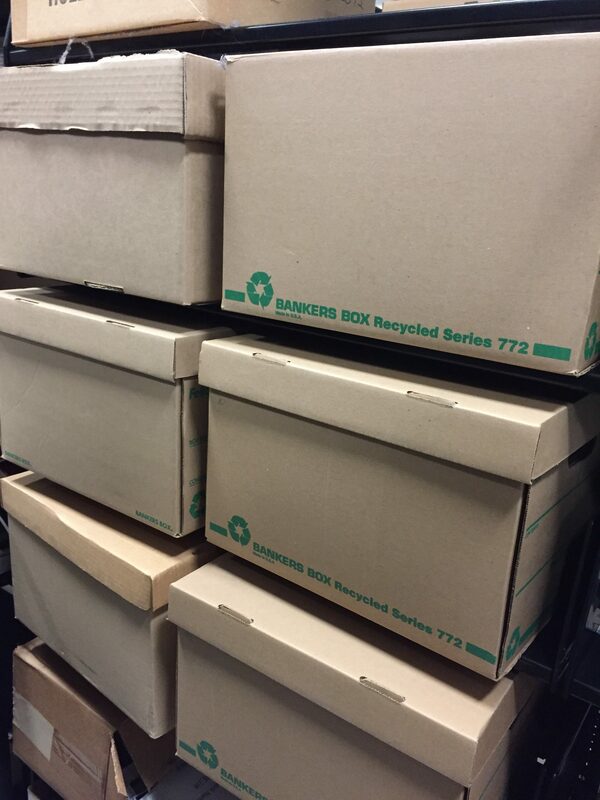 The end result: I was finally able to settle all of my family archives into their proper housing containers, and should any emergency occur, I can lay my hands on a few small boxes with the most important items. Now, when someone asks for a copy of a photo, I can go right to the proper location and digitize at will. 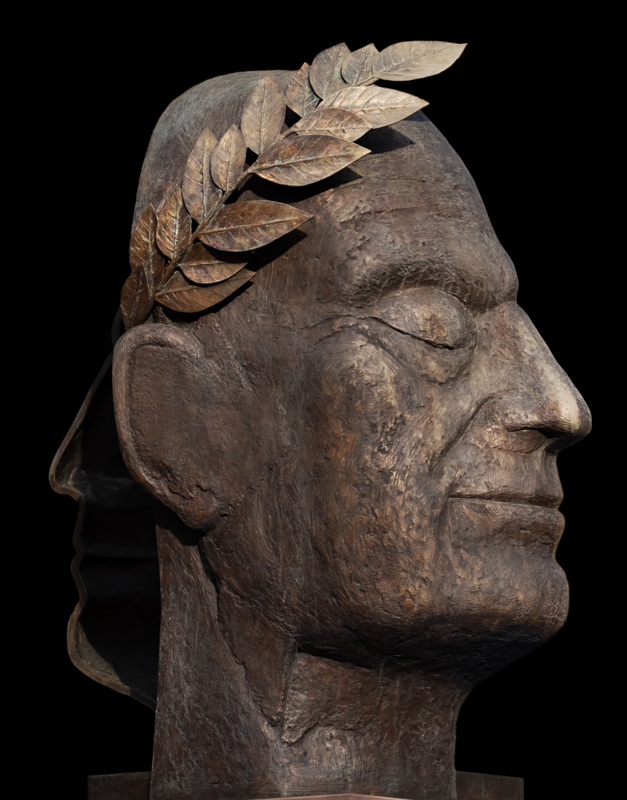 With the above accomplishment that evolved over the course of 2018, and while preparing similarly relevant material for my talk at RootsTech in a couple of months, I am mentally able to move on to the next phase in this transformation. 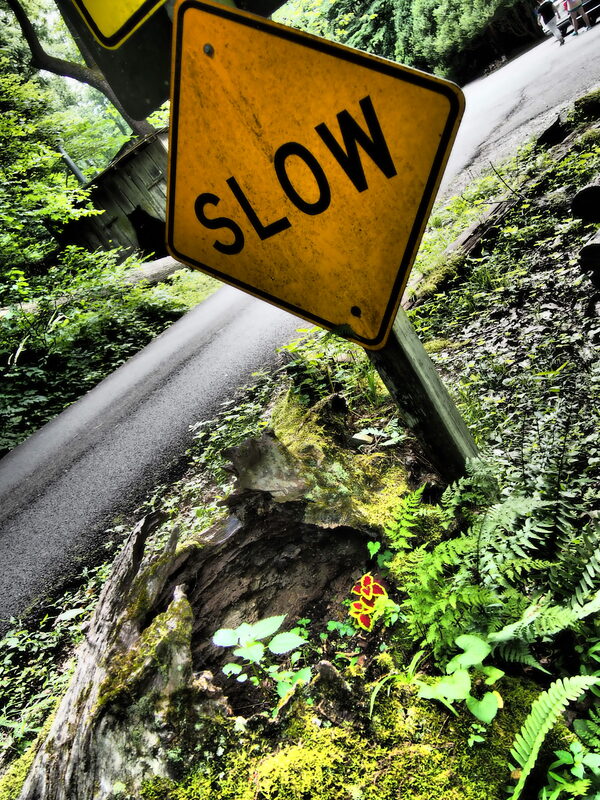 The limited nature of time and the familial value of what I have been entrusted with have directed the next offshoot of growth – a prioritization of sharing. 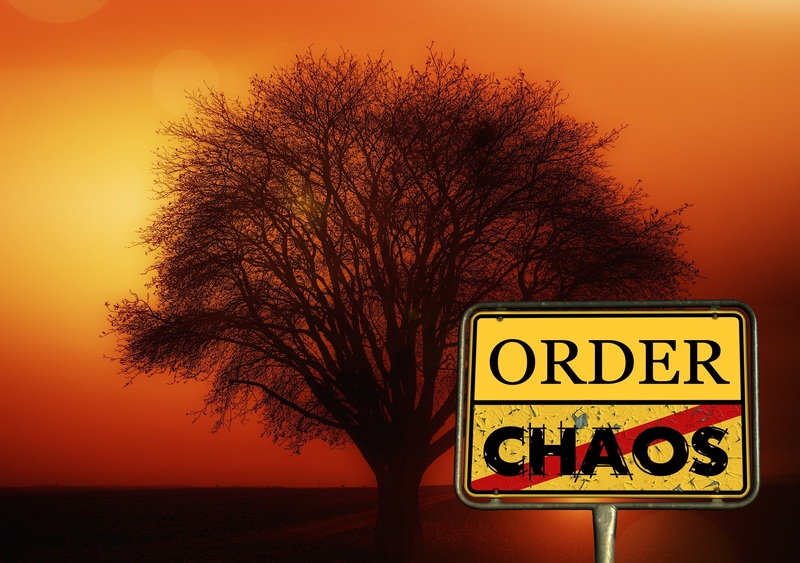 It is the natural progression of putting things in order. There is no longer a hindrance in the area of superfluous pieces of random material obscuring the vital or irreplaceable elements. 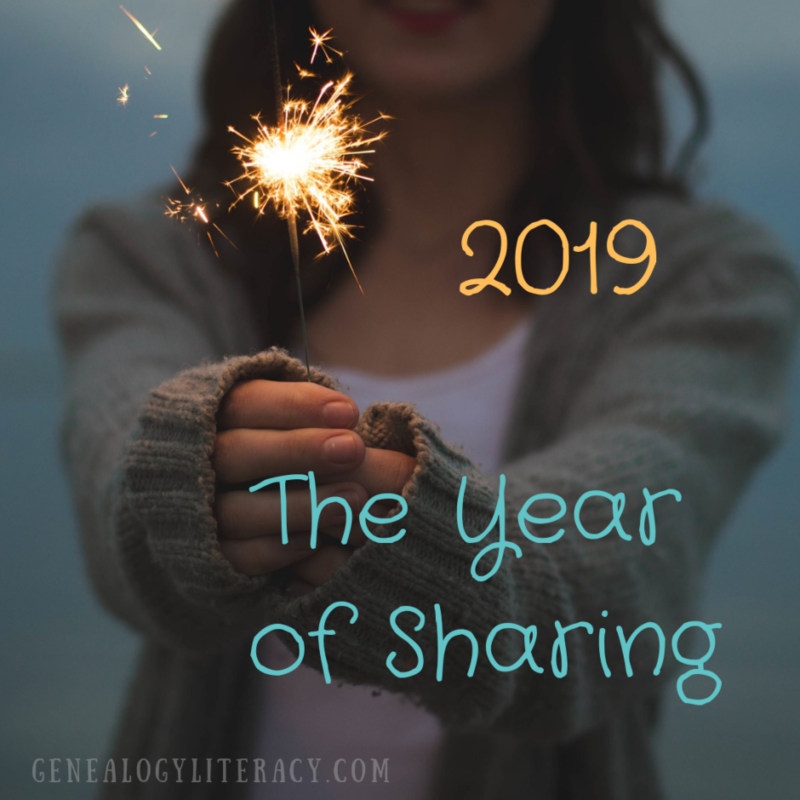 Welcome to 2019’s theme: Sharing. But what does a lifestyle of sharing look like? 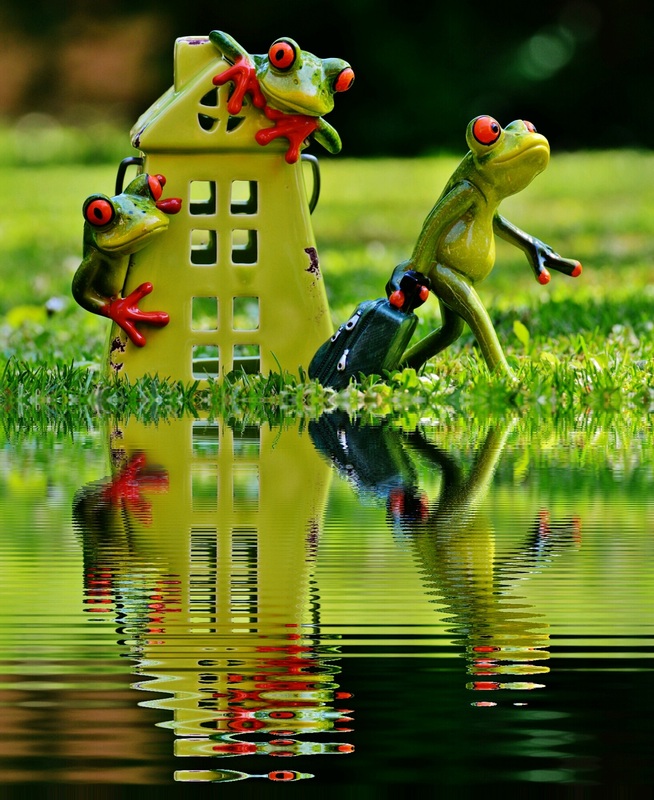 A sharing lifestyle is fluid and looks for a variety of sharing opportunities. 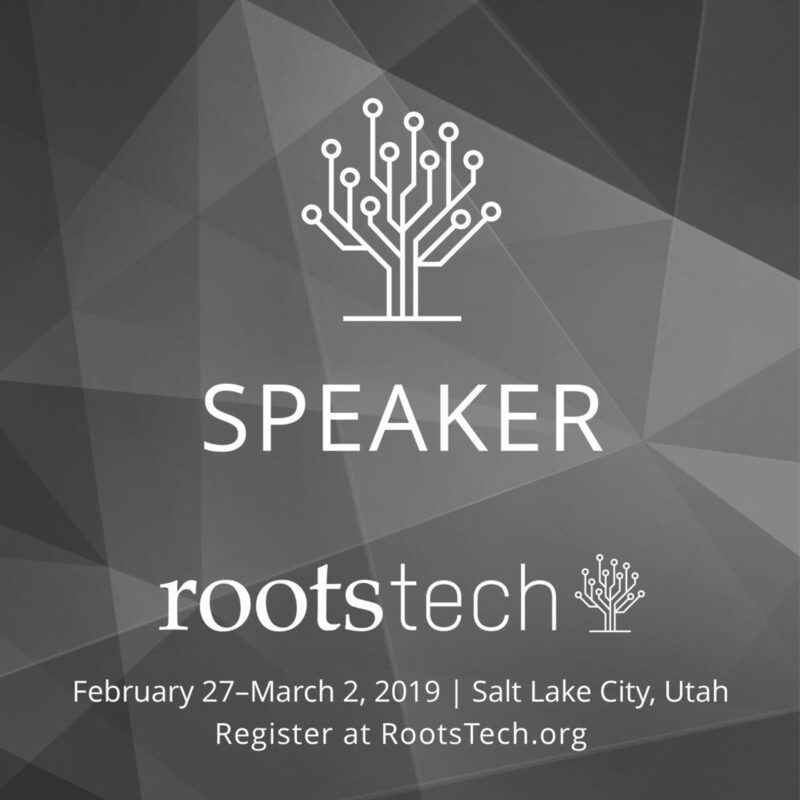 My upcoming session at RootsTech is called: Past Forward: Tech Tools & Strategies for Sharing Family History Through a Consumable Genealogy Plan. Without giving too much away prior to the session, I have learned so much about the brain and how it consumes information. 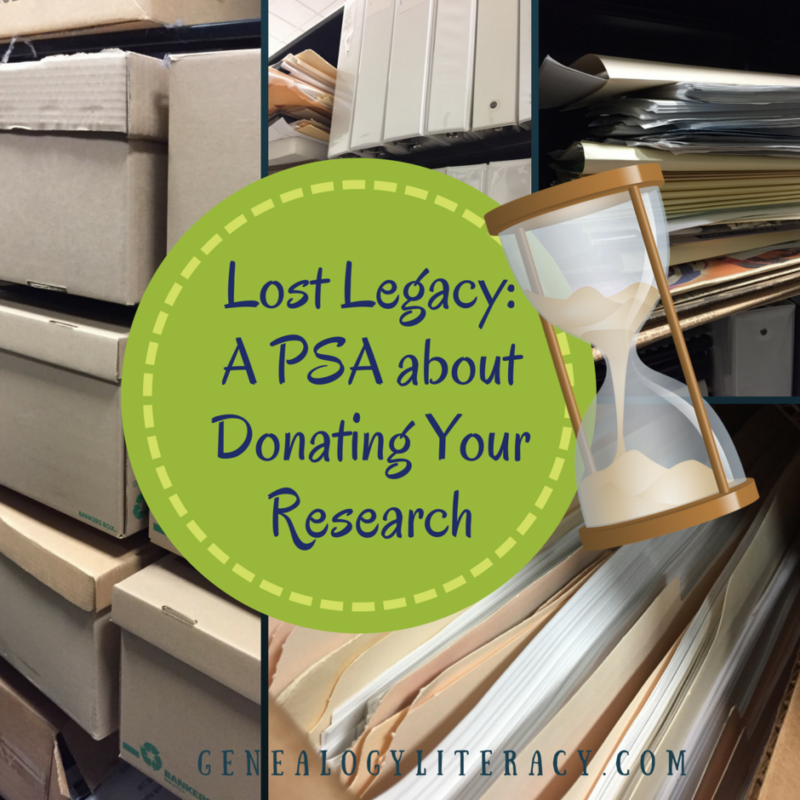 As family historians, one of our goals should be an aim for retention. What can we pass on that will be retained and therefore passed along to the future generations? 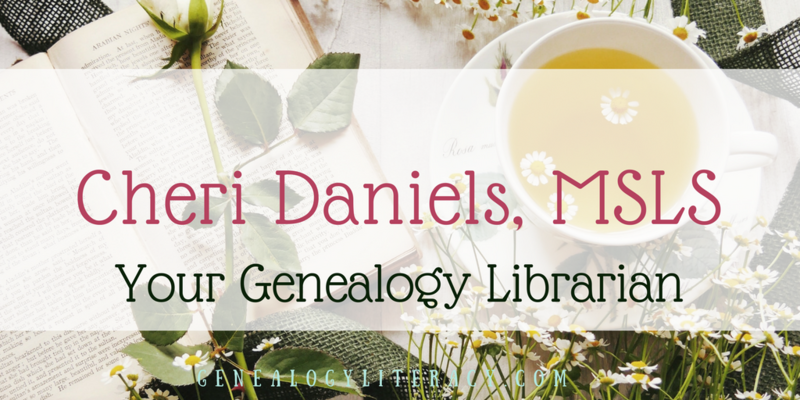 This concept of “consumable genealogy” is my new driving force when sharing family history nuggets. As I move forward in 2019, looking for various ways to share meaningful and engaging chapters of my family history, I will strive to be open to multiple platforms, and learn adaptive lessons from engagement. 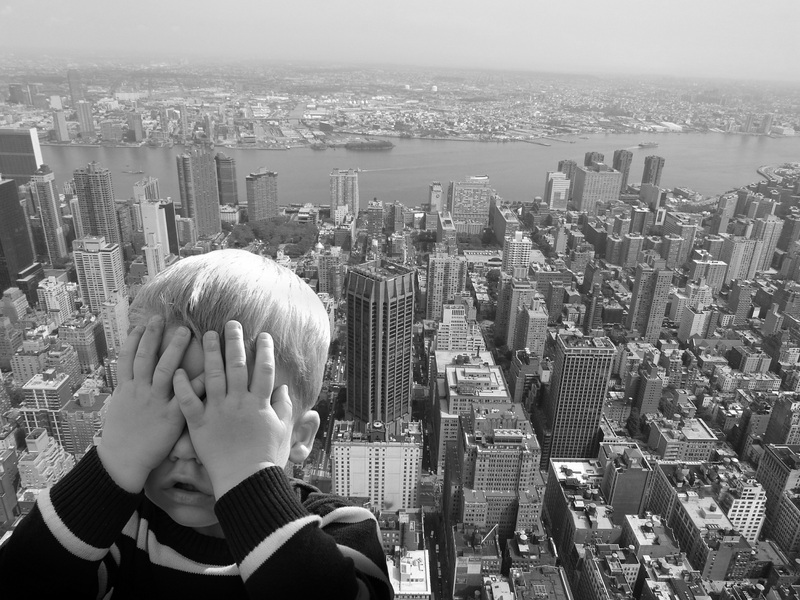 What can I learn from the perspective of others in my family? 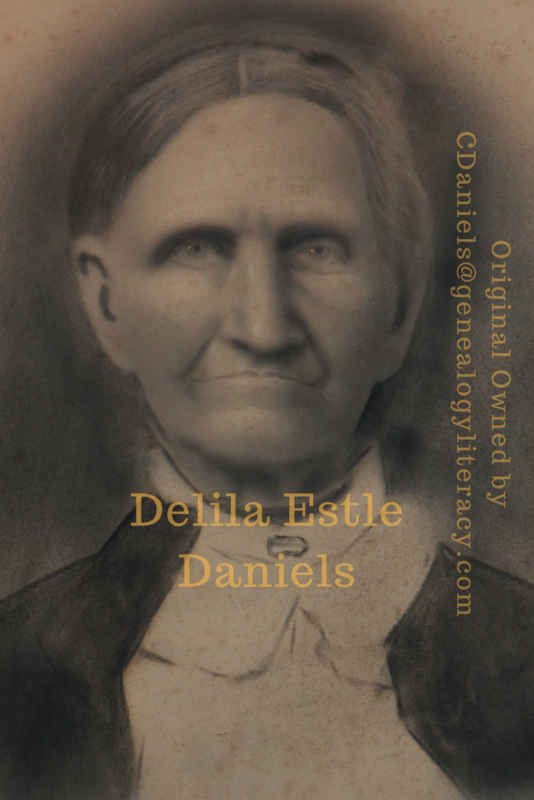 How can I package consumable pieces of family history in such a way that sparks the lazy muscle that sits between our ears? Step one for me is to get a bigger handle on my scanning/digitizing progress in order to have material ready to package for sharing. While I have scanned a portion of my collection, there is much more that needs to be done, and sharing along the way will drive my efforts. Conversely, as much as I strive to produce the mammoth 500 page family history someday, I vow to not wait for that moment to begin my sharing. 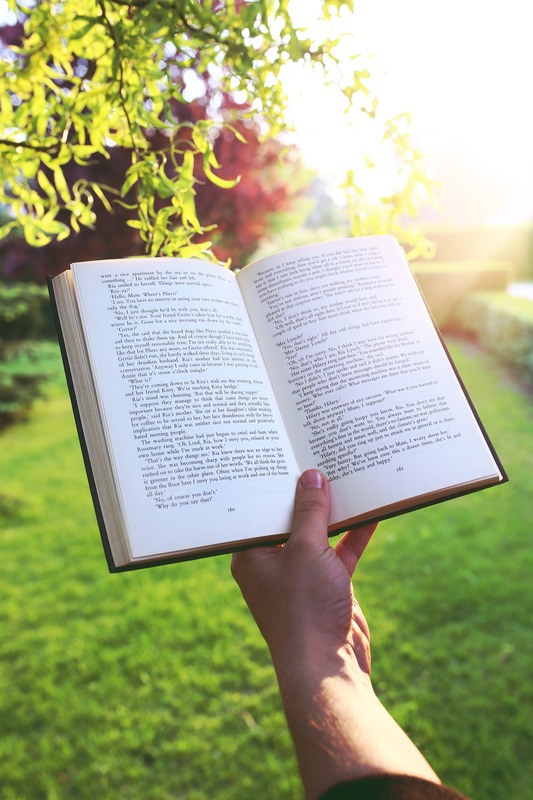 As Charlotte Brontë once said: “Happiness quite unshared can scarcely be called happiness.” And if we replace the word happiness with ‘family history’….. Family History quite unshared can scarcely be called family history! 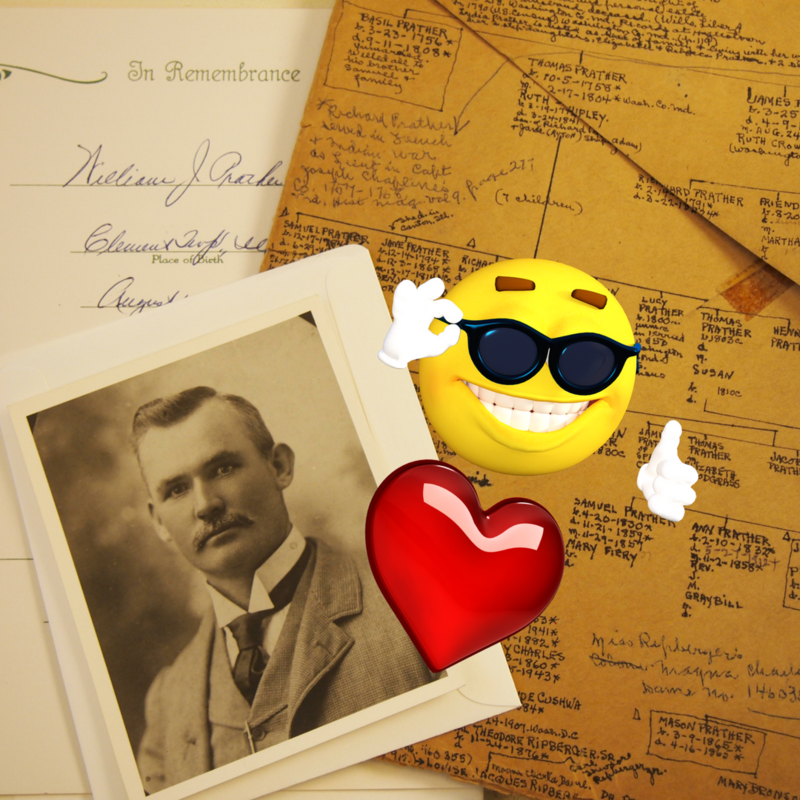 With so many tools out there at our disposal to share our genealogy love, there has never been a better time to live with sharing as a driving force. As much as I hate to say this, it’s time we get smart and vet our memberships to Facebook Genealogy Groups. Just this morning I was scolded and publicly shamed in a very popular Facebook Genealogy group that contains over 16,000 members. My crime? Asking a poster (within a comment string) to consider sharing her state specific story with our state historical society publication – which happens to be a free educational resource for all – created and hosted by a government archival/artifact repository. Good grief! The ironic point of this interaction, is that I always double check the group rules before posting or commenting – because every group can be VERY different. In this case, they only prohibited advertising services or products “for sell” [for sale]. 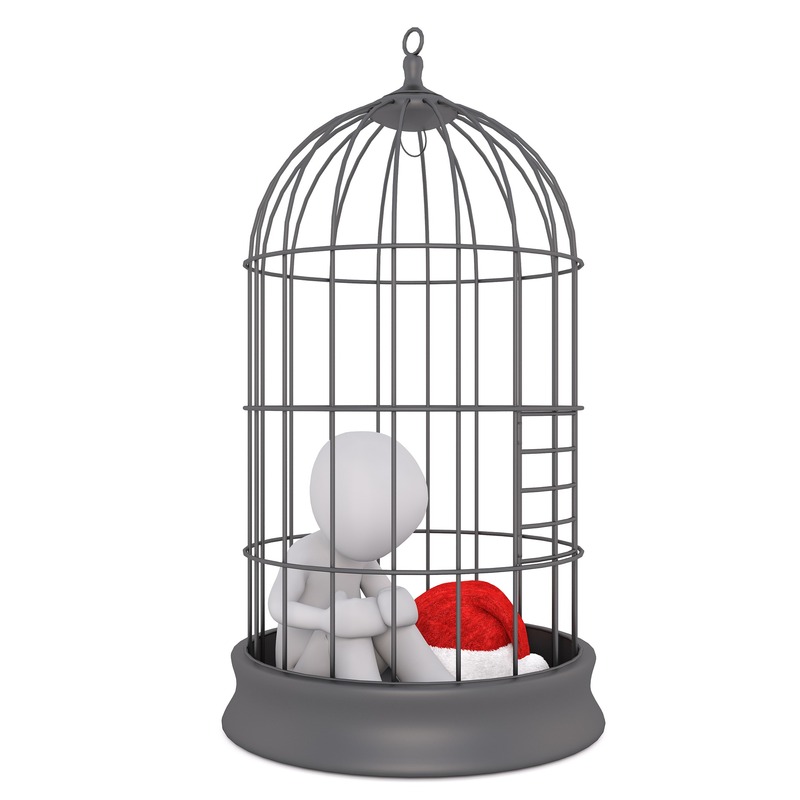 As a non-profit, free educational resource, I was in no way soliciting anything that resulted in a profit – nor was I even advertising – it was a suggestion at the bottom of a very long comment string. But here’s how they handled this situation. They removed my comment and then made a new post calling me out for this shameful behavior. 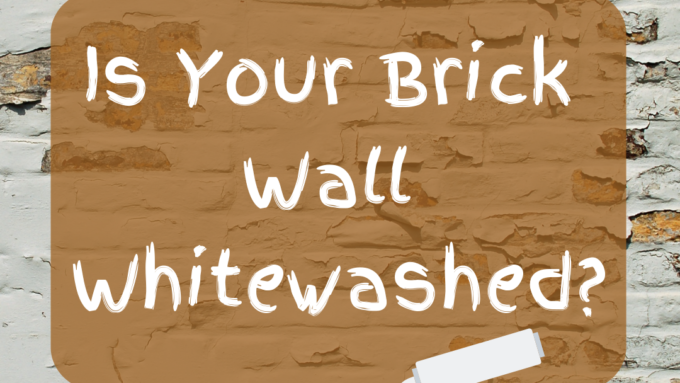 Most group admins will take down a comment or post and quietly message the offender – unless this was a repeat offense, or a problem they keep having with many others. Nope. They instead chose to publicly rebuke my “offense” when in fact, I hadn’t violated anyone’s rules. The admin of the day stated that I should have known better, and continued to lecture that I was ignorant of standard “netiquette”. Unfortunately, my apology and clarification that this was not in their rules (because, you know, I researched their own rules list) simply fanned the flames, and it was apparent that, just like Caesar, the offense was declared, judgement and punishment were handed out and no words of defence would be accepted. So let it be written, so let it be done! Sorry folks, that is an environment that is contrary to the world of kindness I know to be genealogy. Many of you have witnessed this scenario before as well as become concerned over Facebook abuses in all forms reported in the news. 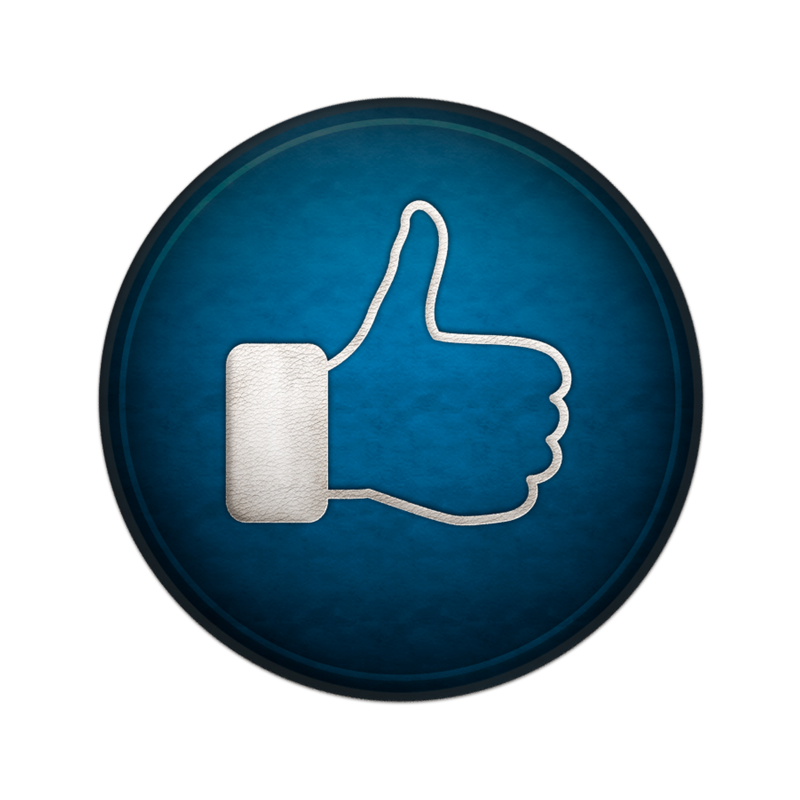 In fact, several users have already left Facebook due to these reports. Over the years, I have embraced Facebook due to the engaging groups of collective advice and dialog. Many of the groups are wonderful! However, I have also witnessed conversations turn ugly in the blink of an eye. Facebook is a place where many people feel it’s OK to be hateful to one another, bully and insult one another, and demonstrate the very worst of humanity. 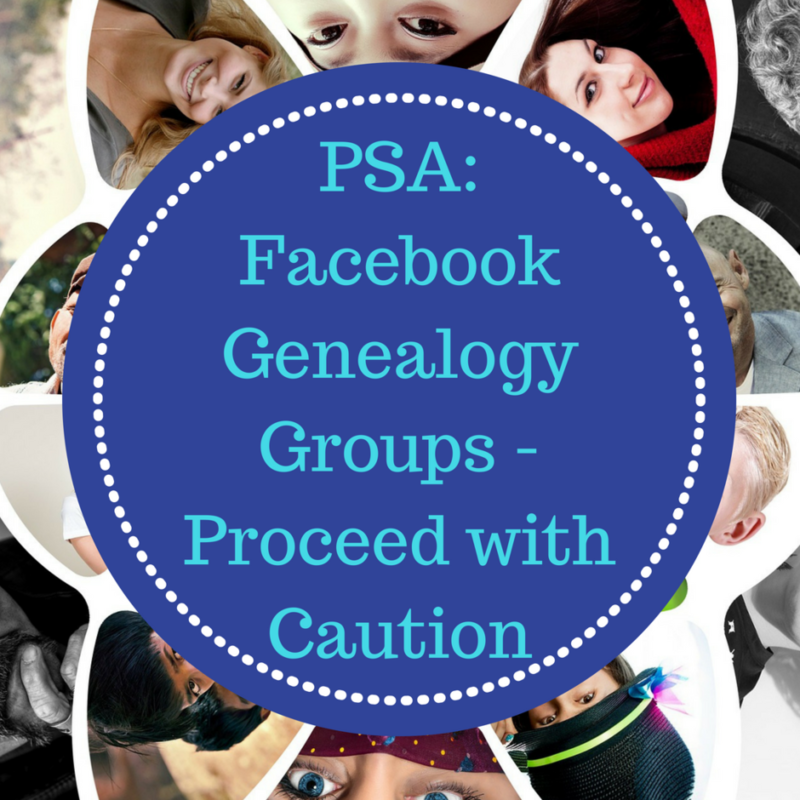 But let’s take a closer look at genealogy groups in particular. 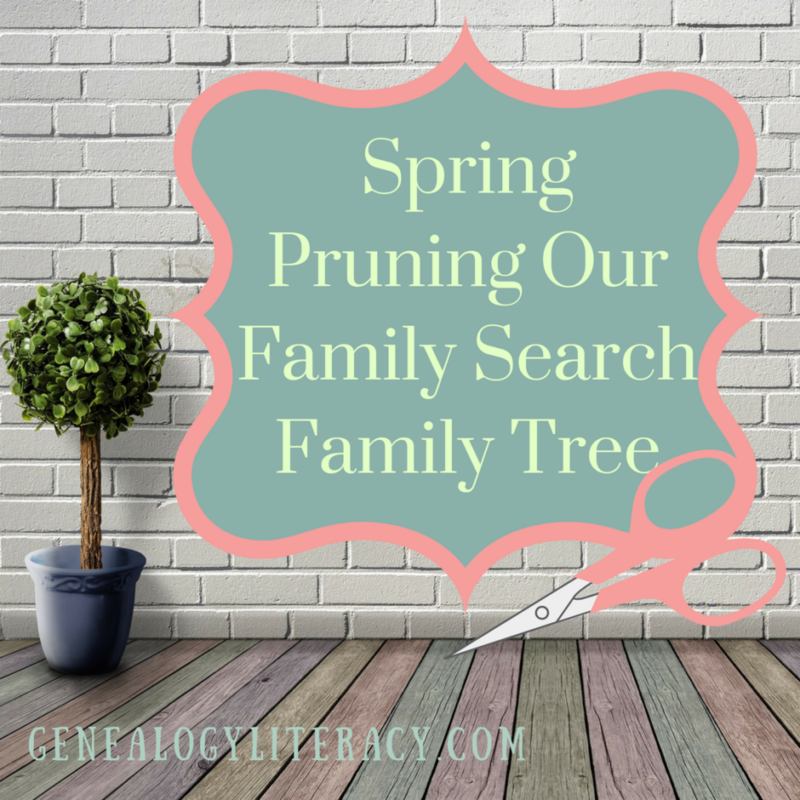 The best genealogy groups are usually topic or location specific. 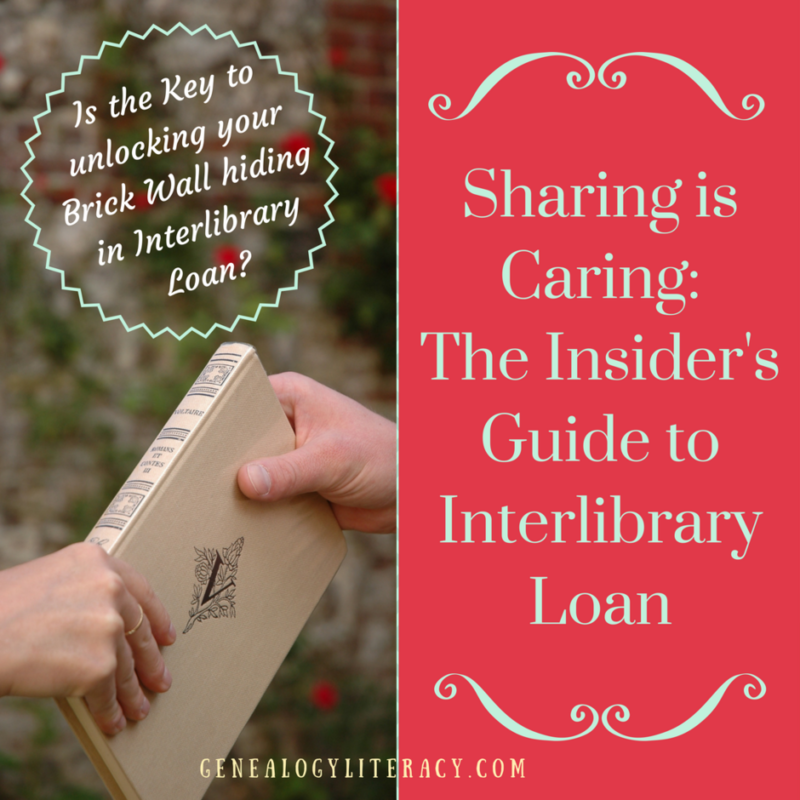 Local genealogy groups by state or county are research/dialog rock stars! They provide invaluable insights to those of us who are out of town – a true “pay-it-forward” kindness in the form of “boots on the ground” volunteers. 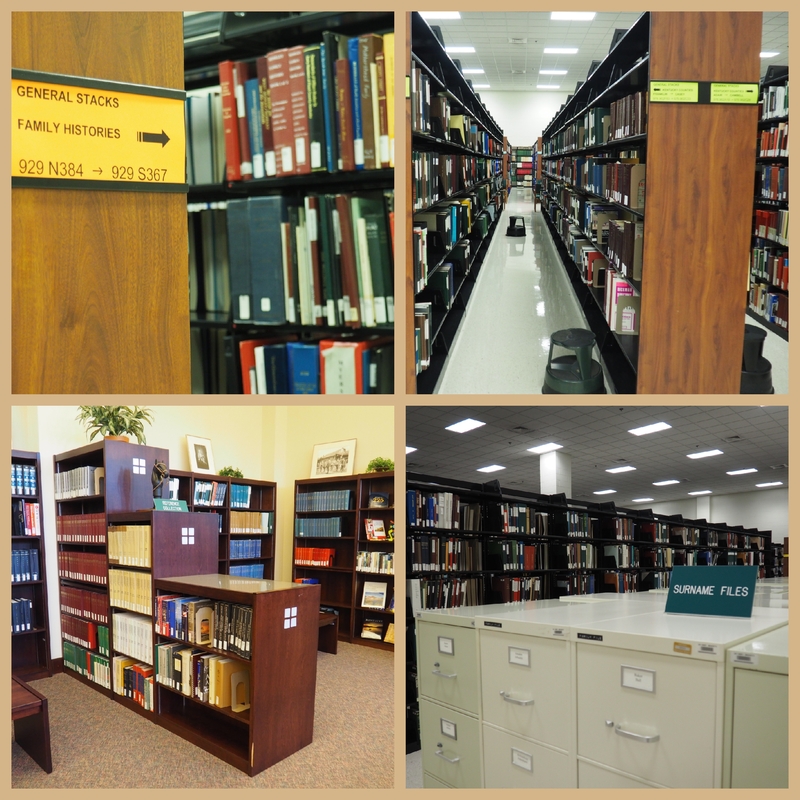 It is apparent that they love their community and want to share the historical/genealogical love. I have been the recipient of many acts of genealogy kindness from these research angels, which demonstrates the goodness and kindness of the genealogy community, and why Facebook is still a place to get some rock-solid advice and assistance. 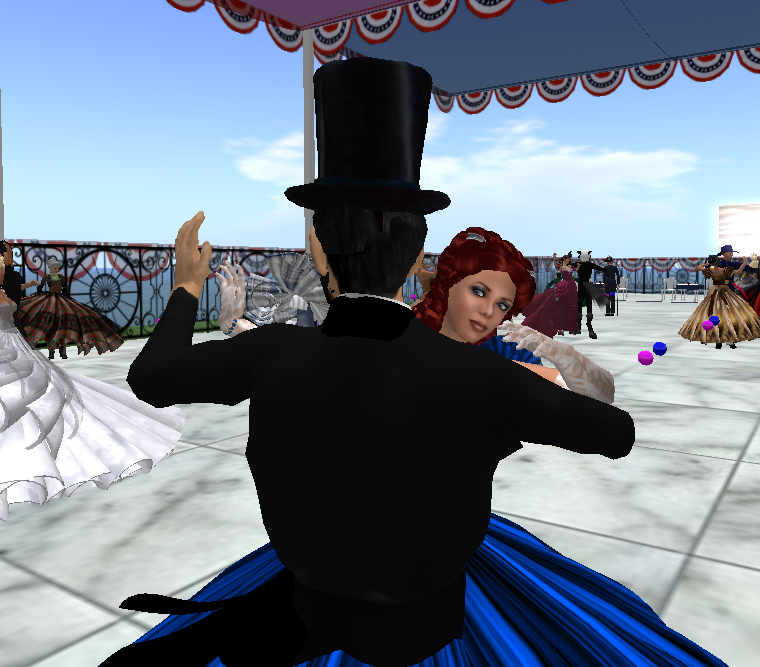 The least helpful groups out there are usually too broad in focus to provide much more than cute memes and a burgoo of stories that might be fun, or might be silly, but do not provide much educational advice or meaningful dialog. Their topics are so various that following along becomes mentally exhausting, with little educational meat to show for your efforts. In worst case scenarios, the atmosphere turns toxic, with rampant criticism, insults, shaming, bullying, which often begins with or is encouraged by the behavior of the admins. 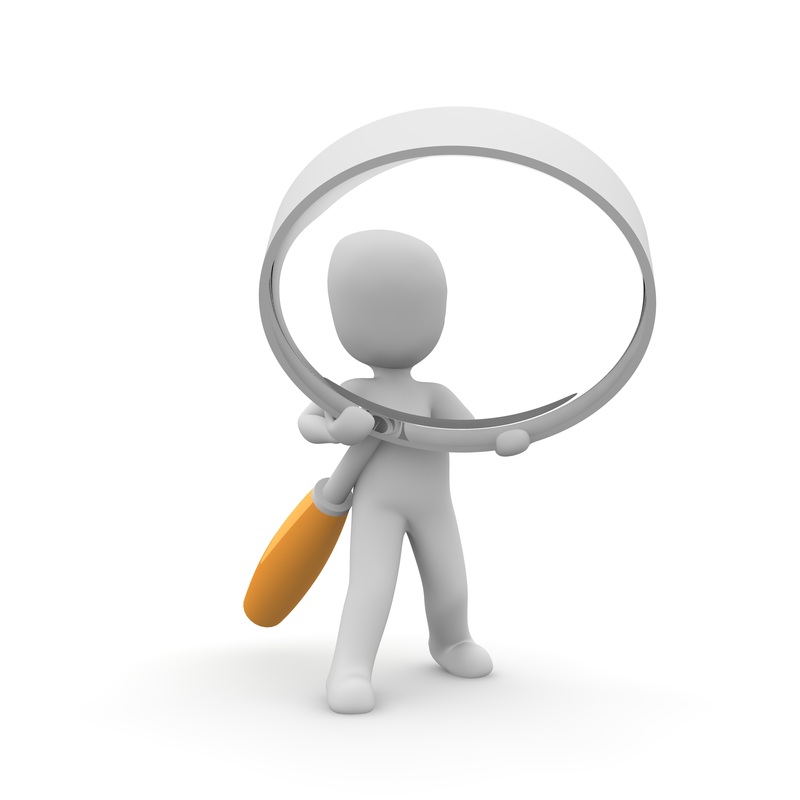 When you become a new member, take a really close look around before engaging with the other members. 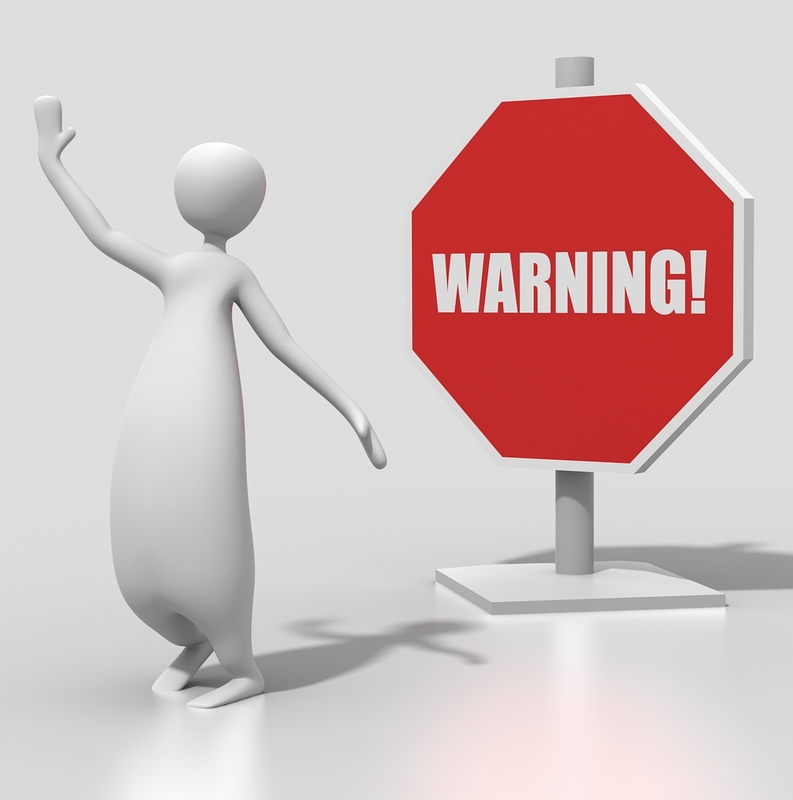 Read all group policies or rules FIRST before commenting OR posting ANYTHING! Also, be sure to read the comments below these rules – they can be very telling. In the group that bullied me this morning, there was a telltale comment from another victim that had simply posted a small story about a relative that had died, which included a link to the obit. As she was grieving, she didn’t notice the link included a Go Fund Me section for family assistance. She was apologetic, but it was clear from the conversation that the admins would not back down on their rebuke. As she was clearly sad after losing a loved one, this admin behavior was particularly mean spirited. Of course, I didn’t see this until I started poking around after my own rebuke. READ THE ‘ABOUT’ PAGE! 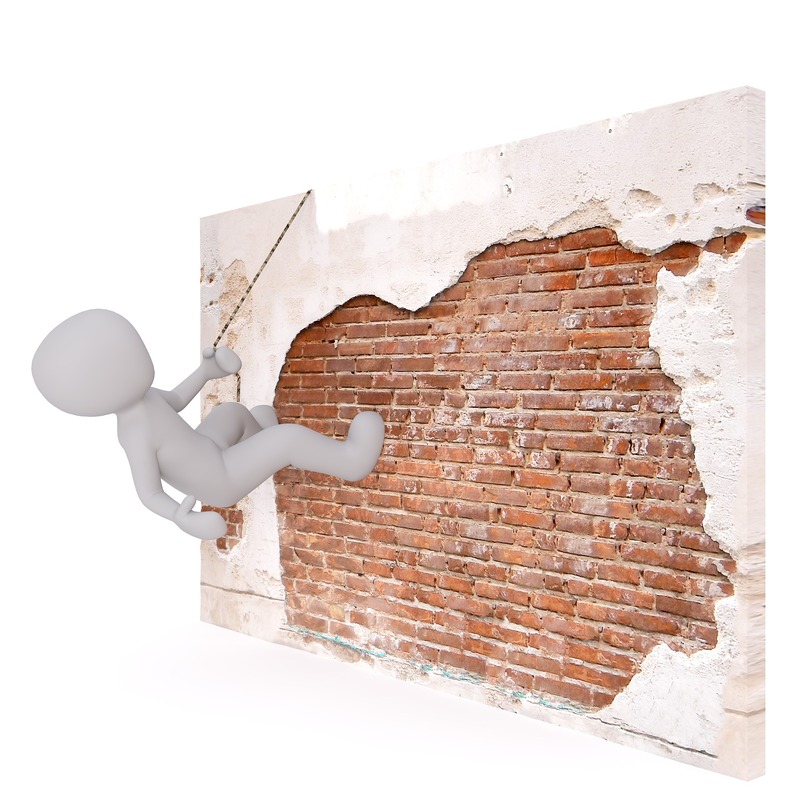 This is vital to getting a feel for the intent behind those who created or admin the group! Unfortunately, once I began digging into the About section, I discovered an advertisement about their new magazine they created as an offshoot of the group. Which leads me to believe they were not upset that I broke an invisible rule – but rather upset that my comment pointed Kentucky researchers to a free educational publication. They clearly viewed my post as content competition, and hid their bullying behind tech shaming and absolutism. Go over the admin list, their genealogy backgrounds, and their past interactions among the group. I have been a FB group admin many times in the past, and I can tell you it’s a thankless job with many hours spent wrangling trolls and herding cats. 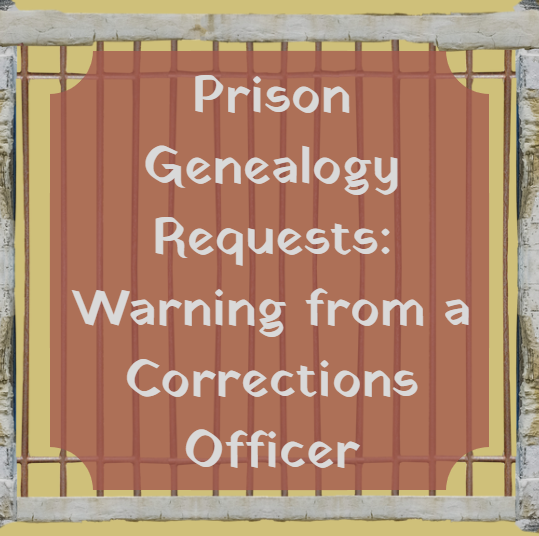 But if the admins have no genealogical educational/professional background and they are truly hobbyists that do not help educate others, walk away quickly or their rule police will haul you away at any perceived infraction! Also a red flag: When they declare the group to be a “drama free zone” they’re not talking about themselves – just you! 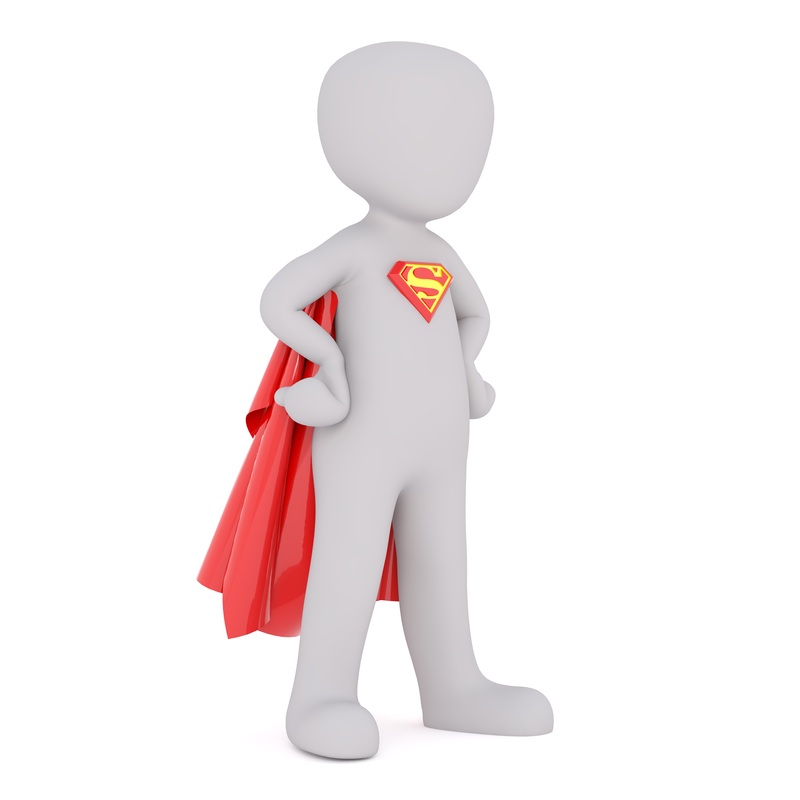 The admins can be as dramatic as they like, and you have no power against it – so again, leave quickly! 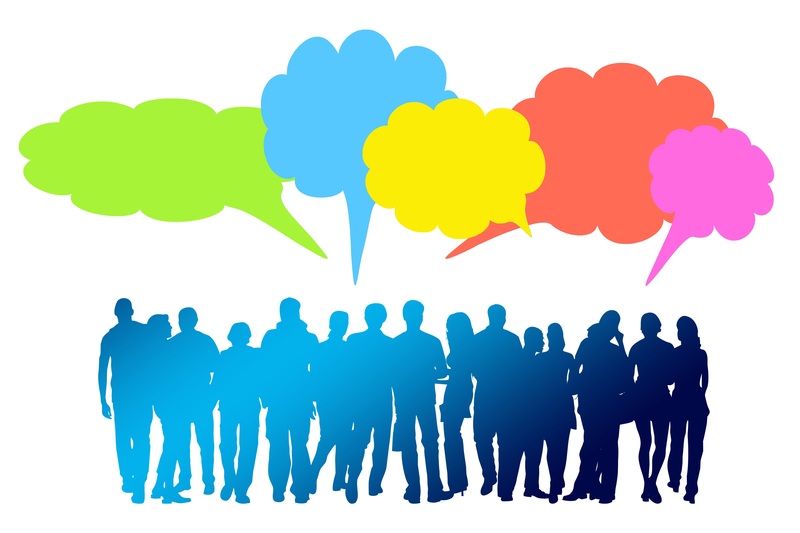 Review previous conversations – is the group helpful, encouraging, educational, and welcoming – or are they simply opinionated without educational substance? Might I remind everyone that false trees and unsourced genealogy is the modern scourge of genealogy – if we don’t surround ourselves with educational groups, we don’t grow. 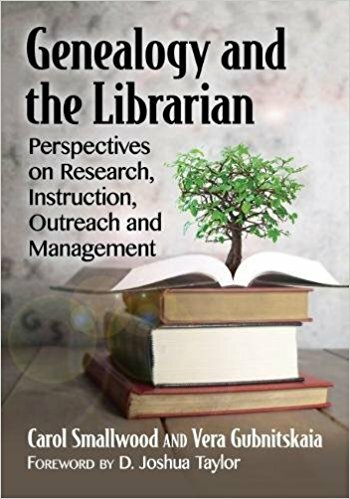 And with the fictional trees that have flooded online databases, these types of groups can contribute to the problem with their proliferation of unsourced advice. 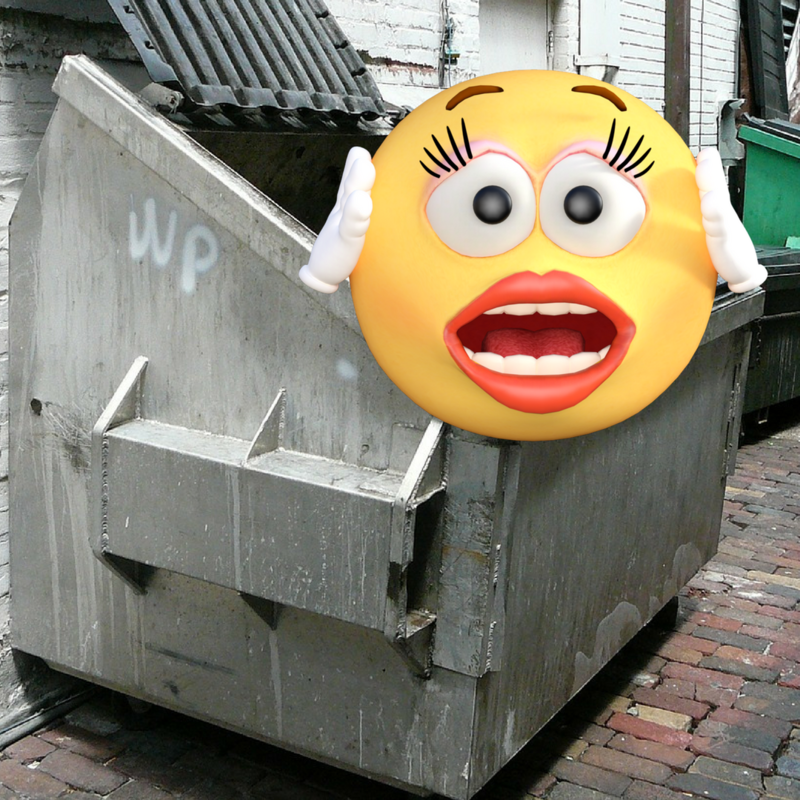 Bye, Felicia! How many have seen this dismissal used within FB Group conversations? You will often see this used to dismiss anyone who chooses to disagree with the collective, or more importantly, the admins. The person who dares disagree, and voices their contradictory opinion is dismissed by the group as irrelevant – either just before they leave the group willingly, or are ejected. Make no mistake, this too is a form of bullying. It has become all too common among the hive mind of FB Groups. 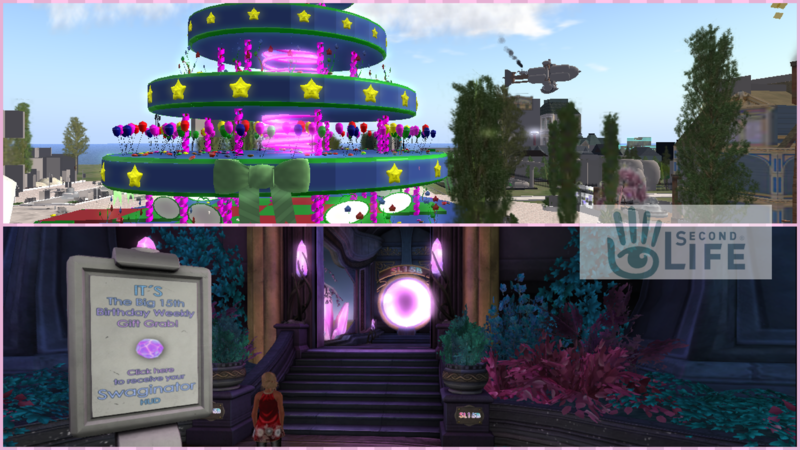 Whatever you do, do not upset the admins or the most powerful group participants! They surround the lone voice in order to silence it – rejoicing in their victory once the voice has been removed. Just like the Borg mind – Resistance is futile. The moral of this point in the story: once the group dislikes your contradictory stance, just leave. They aren’t worth your time – find a welcoming place that fosters a healthy collaborative environment. Oh, and just a reminder that healthy dialog includes diverse opinions. And as a supplemental point to the above, defending your actions or even trying to apologize will not be of any help. Admins who enjoy the power too much will not listen and would love nothing more than to vote you off the island, regardless of whether your words make common sense. I had one person remove a post in an abandoned historic structures group because it listed the address, which was against their rules – but the property was for sale! The realtor wanted the address publicized to drum up interest and save the property from ruin! Despite this reasonable exception, the admin loved their power more than saving a historic property, sending a clear signal that they would never listen to reason beyond their own, so I just quietly left the group. 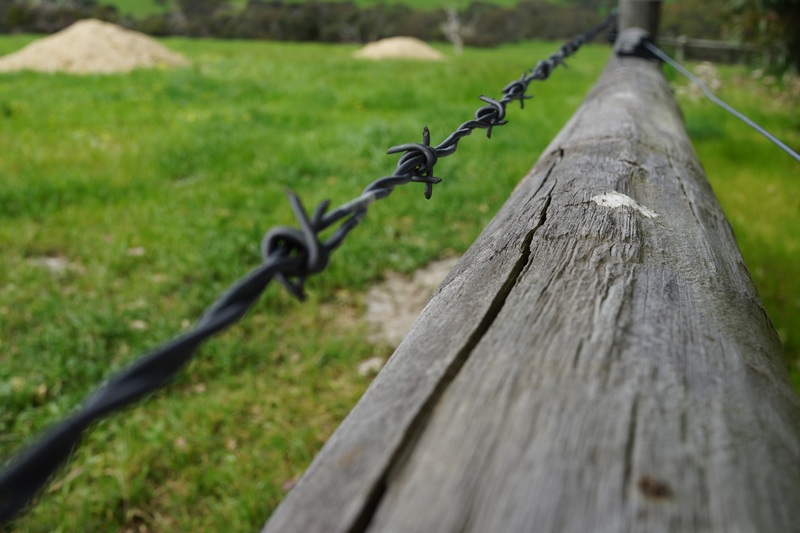 I know this post will not be popular – as it reminds us that even roses have thorns – and ignoring their presence does not prevent us from getting stuck. 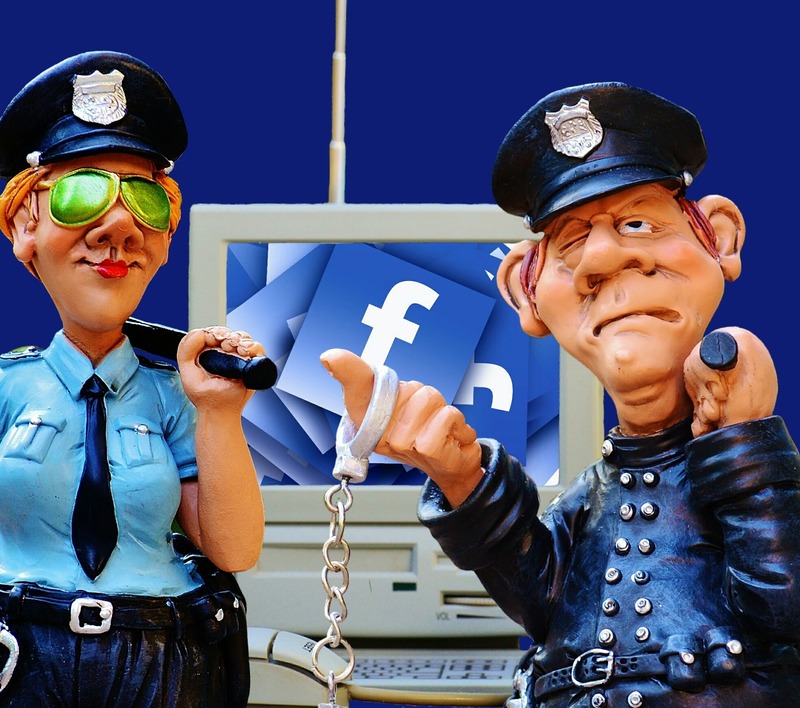 It is high time we recognize the other heinous part of Facebook beyond the privacy breaches: the bullying and abuse of power to silence diverse thought. 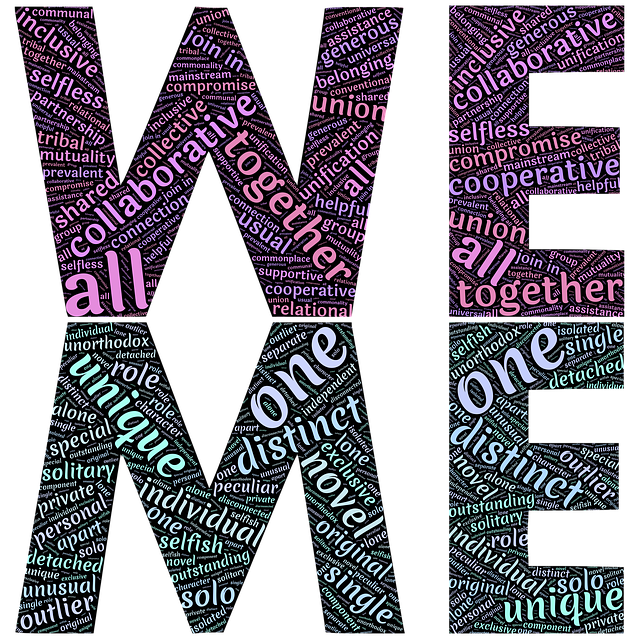 More importantly, when the genealogical community has a hard time being civil to one another in this environment, it’s time to reevaluate our participation! Life is too short and the research too long to treat others in this fashion. 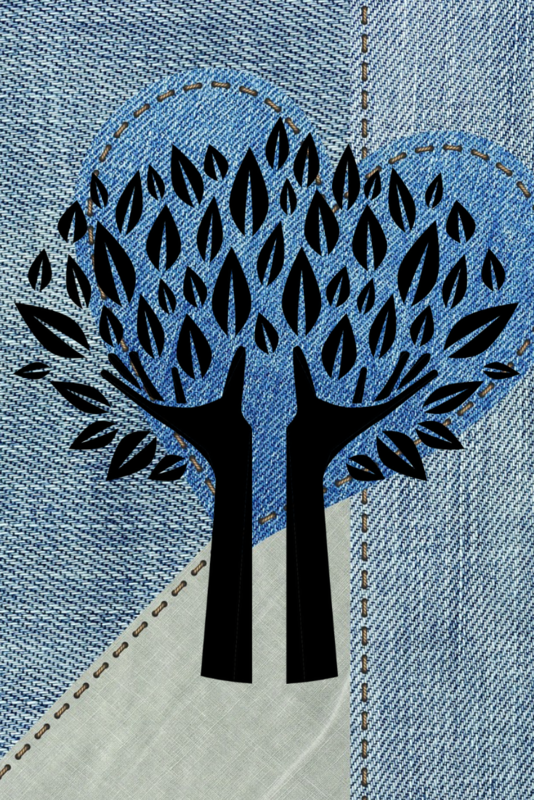 There are so many wonderful Facebook Genealogy Groups out there – but proceed with caution and BE SELECTIVE – be kind, and if they throw you to the wolves, dust yourself off and find a healthy, welcoming genealogy space. 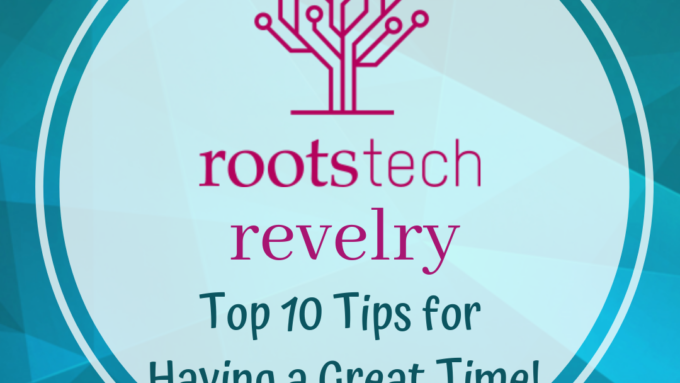 It is with great delight that I announce my return to RootsTech after a self-imposed hiatus! I was notified last week that one of my proposals was selected for 2019! To be honest, the RootsTech conference is a pricey one, and, even with speaker assistance, I cannot always afford the trek out west to the beautiful Salt Lake City. 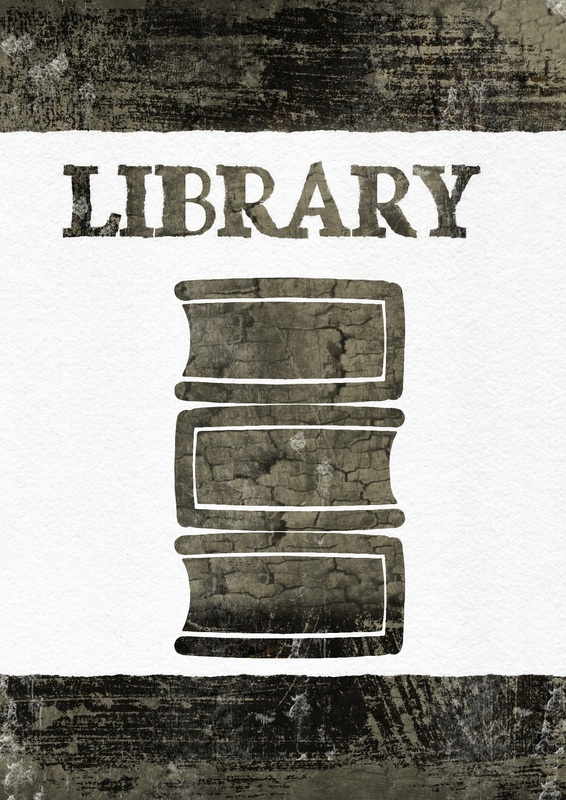 I am just a librarian, after all! 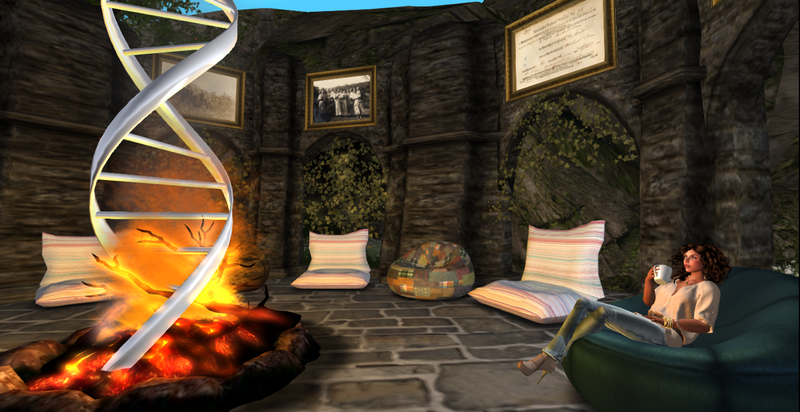 However, each year, my geeky genealogy heart yearns for this kaleidoscope of tech wonderment! It had just been too long since attending, and so I threw my speaker hat back into the ring – luckily, they picked it up, once again! 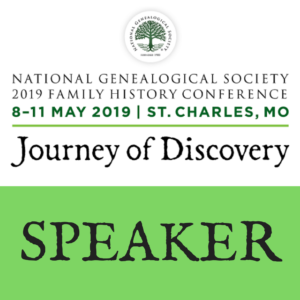 There are so many reasons why this is my favorite genealogy conference, and I won’t get into all of them, but I will feature many as the conference draws closer. 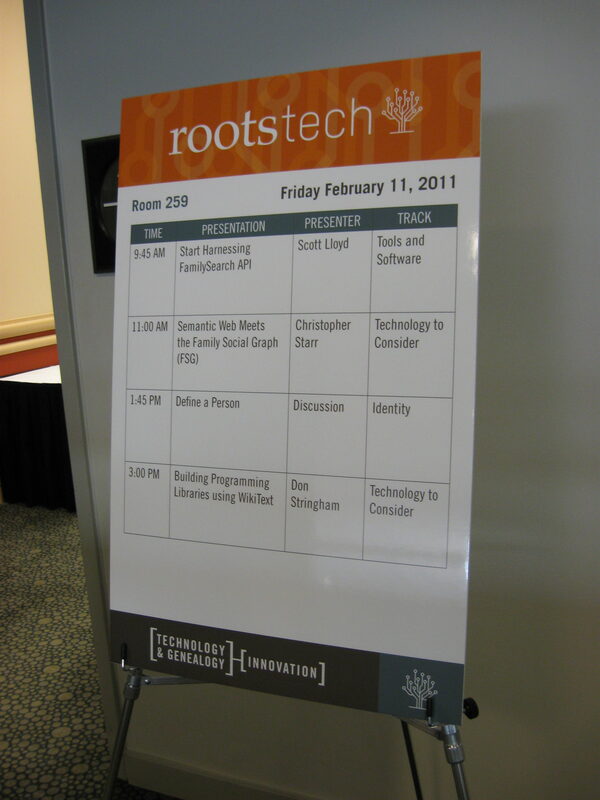 My relationship with RootsTech began with its inception in 2011. 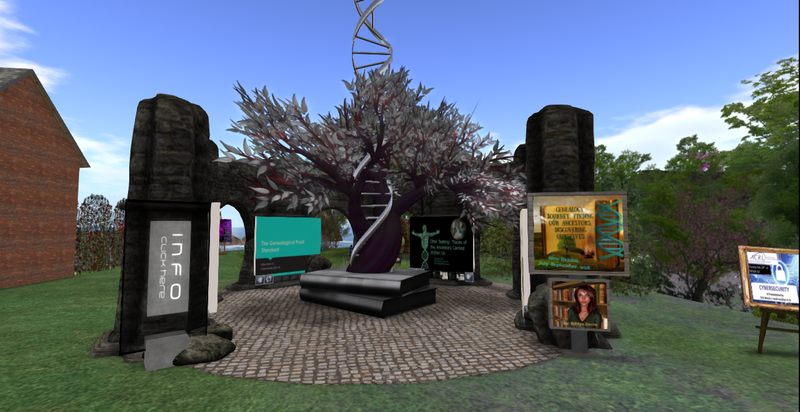 That year, my business partner was selected to present two tech sessions which planted the seeds of semantic web structures which we see in use throughout many of today’s family tree software products. After multiple brainstorming sessions with Family Search developers over dinner (at RootsTech, and previously at FGS in 2010), we could see the direction our future was about to take, and today, we all reap the benefits of that first year! 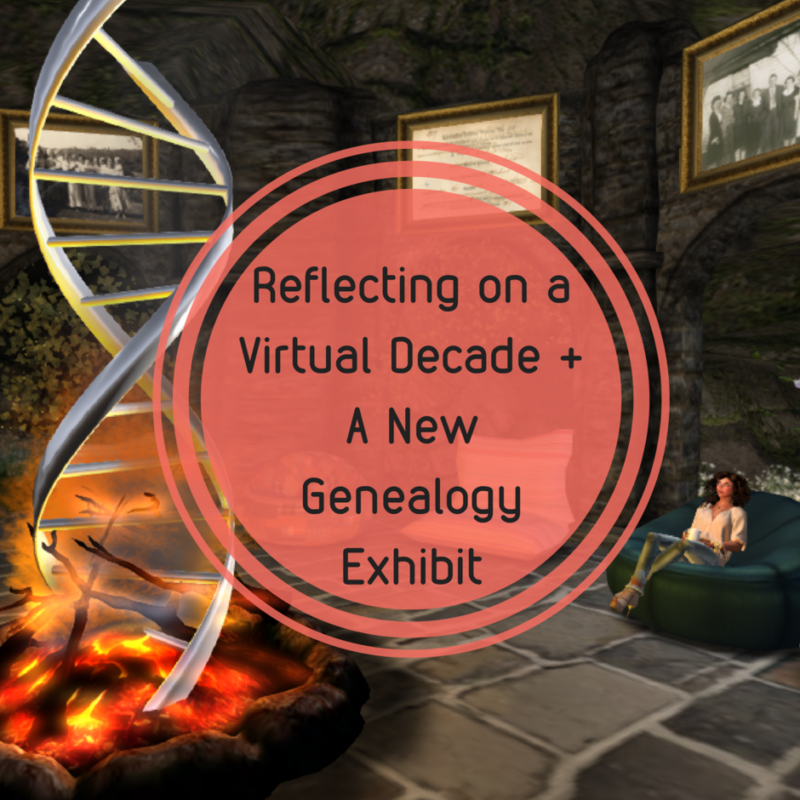 Of course, we could all see the writing on the wall: We had just witnessed the birth of something truly special – a genealogy conference unlike any other! 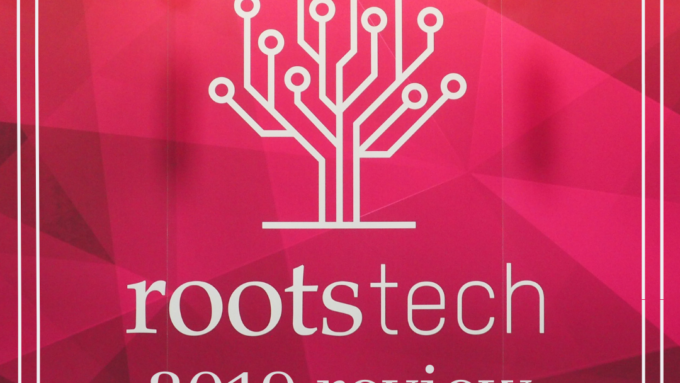 I cannot begin to list all of the great memories of RootsTech over the years! After 2011, I was fortunate enough to attend a few more years, and speak at one. By that time, I was also speaking at the other national conferences, and really busy with my day job in Kentucky. 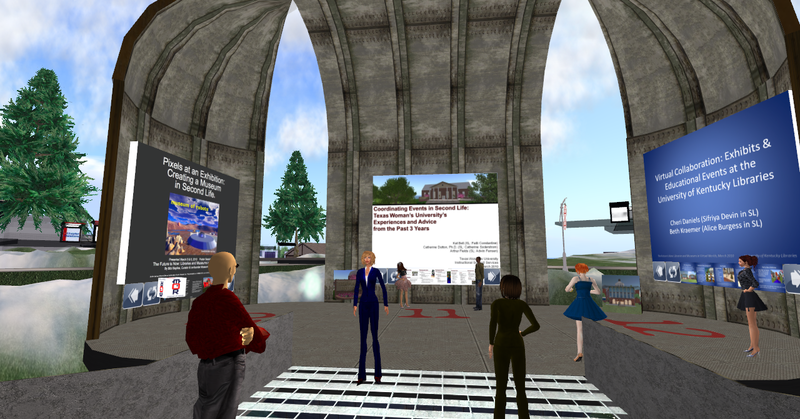 I have been so thankful for the increase in online sessions provided each year – it keeps those of us at home connected to the energy of this wonderful conference! 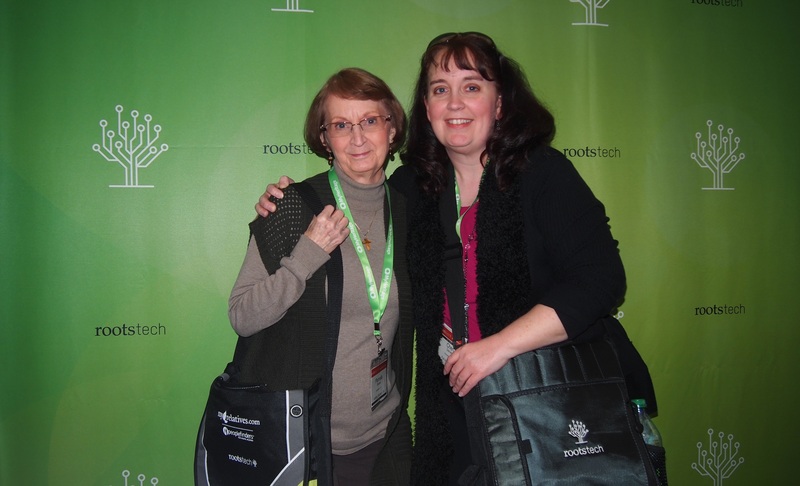 Mom’s first RootsTech back in 2014. 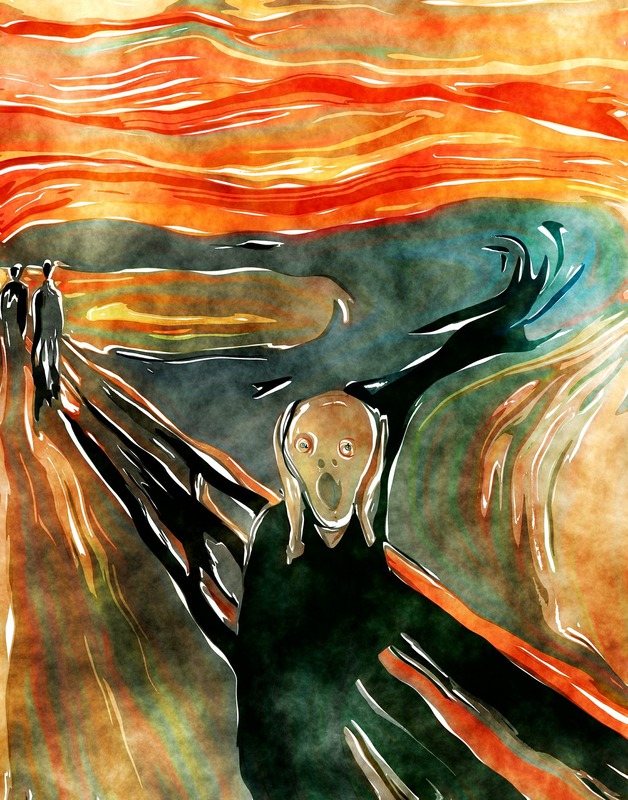 I know I’ve just used a lot of exclamation points, and I’m sorry, I’ll calm down now….well, only a tiny bit. 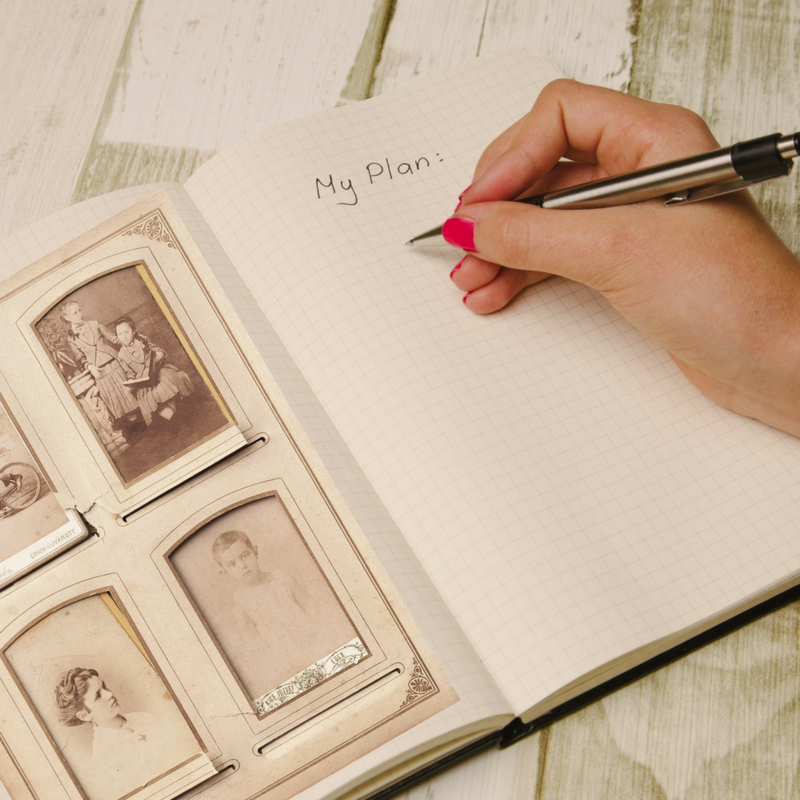 In 2019, my session will be: Past Forward: Tech Tools and Strategies for Sharing Your Family History Through a Consumable Genealogy Plan. 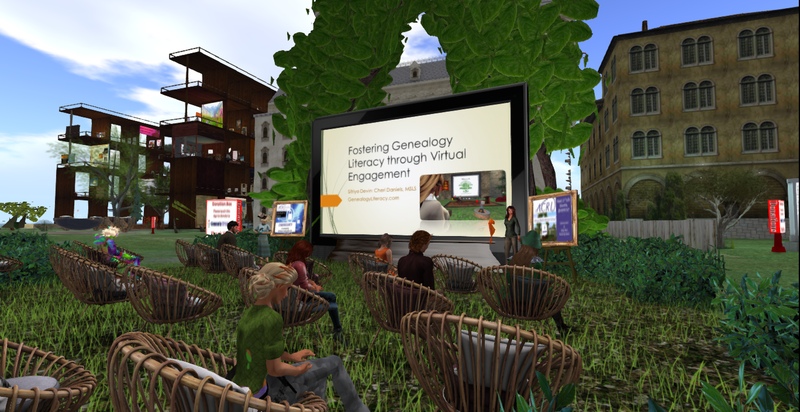 This session will explore emerging communication methods and the technological tools that make these methods possible. 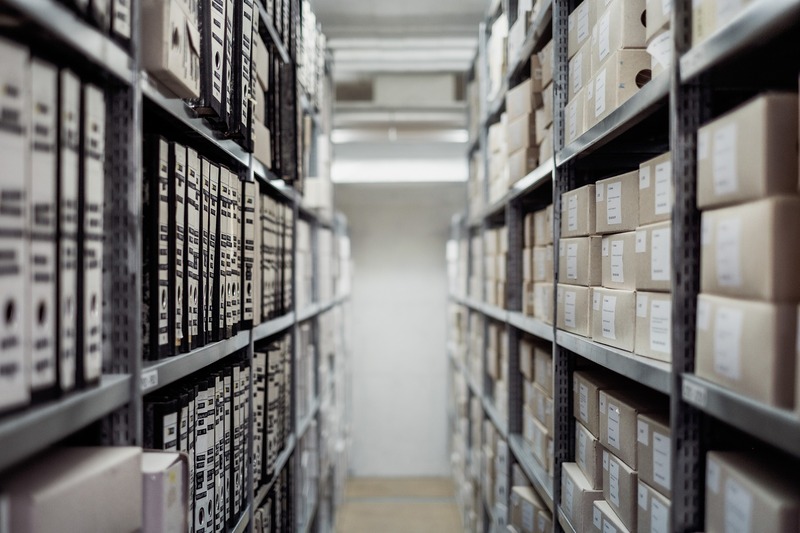 We will then explore the concept of “Consumable Genealogy”: packaging your family history into brief nuggets of stories, photos, recipes, audio and video memories, that are perfect for sharing and preserving in family collaboration friendly environments. 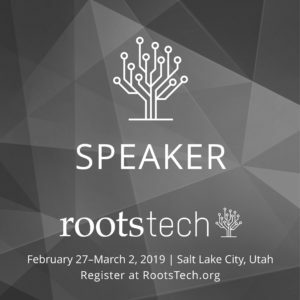 As I said earlier, you will no doubt encounter additional RootsTech focused posts leading up to and after the 2019 conference. However, I specifically chose NOT to apply to the RootsTech Ambassador program. In the past, I have praised this conference, while pointing out little areas of improvement that I encountered along the way. As my blog will always be a “truth zone” based upon a foundation of honest analysis and advice, I don’t want to filter my thoughts or experiences. 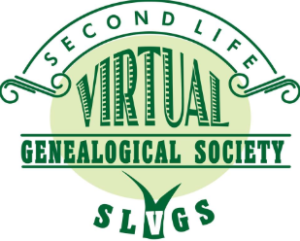 Here’s a link to my previous RootsTech posts over the years, back at Journeys Past. Thanks for enduring my giddy gushing about RootsTech, y’all! Hope to see you there! 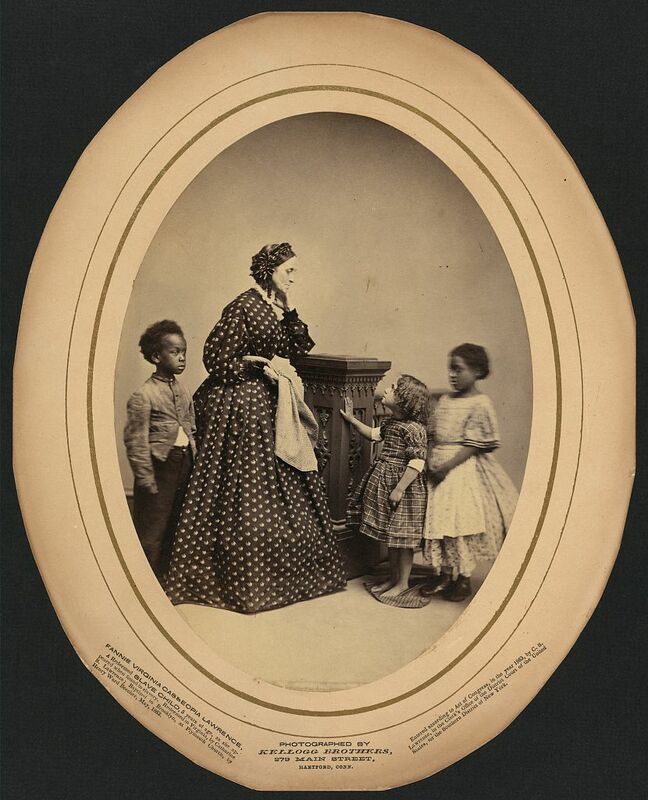 Question: One of our academic researchers was following the life of a single African American woman in the late 19th century. 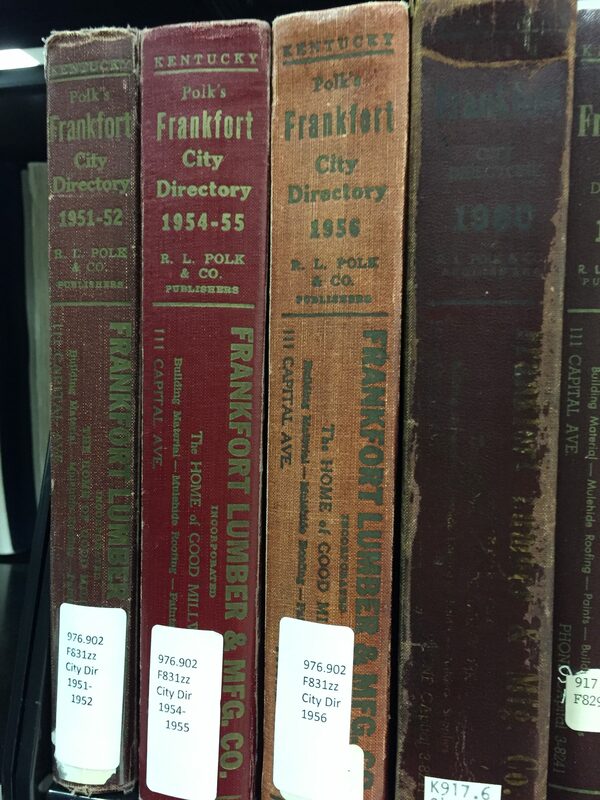 As she turned to City Directories to track residences over the years, she posed a question to us regarding the creation of these directories. She wanted to know who was included in these yearly guides. Obviously, not an entire household, but not always the head of household either. Was everyone included in a City Directory or did you have to pay to be listed? After all, these were valuable resources for advertising your business during that time. What a great question! 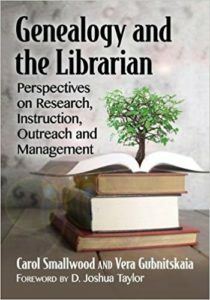 As many as I had used over the years, I really hadn’t closely examined the creation of these resources. The impression I had of City Directories came from the gaudy fonts and large advertisements speckled throughout each volume. I suspected that inclusion was fee based, but I didn’t know that for sure. I was just happy that they listed some of my ancestors (sometimes with spouse), their occupations, and addresses over the years. Little did I know about the process of gathering these names. 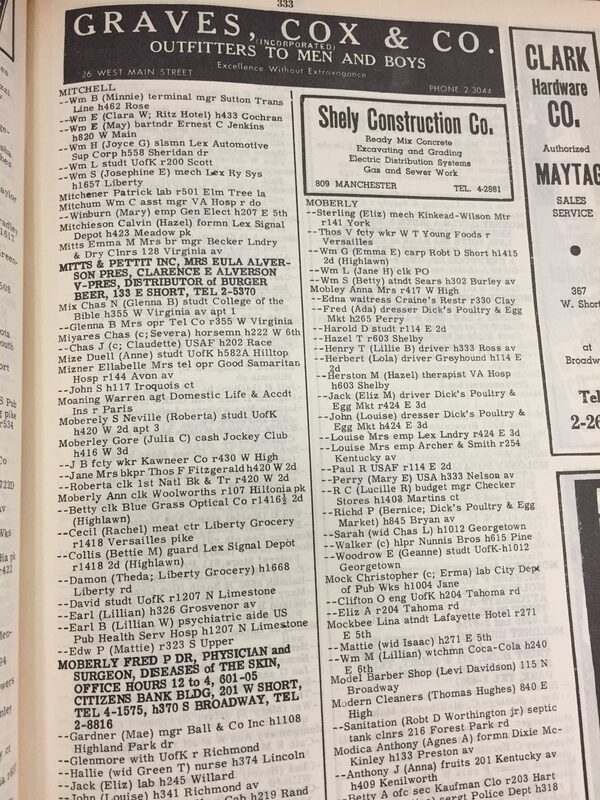 As I started digging for more information, I noted that most of our directories, regardless of year were produced by outside companies – not city, state, or federal government entities – nothing official – very much like today’s phone books. 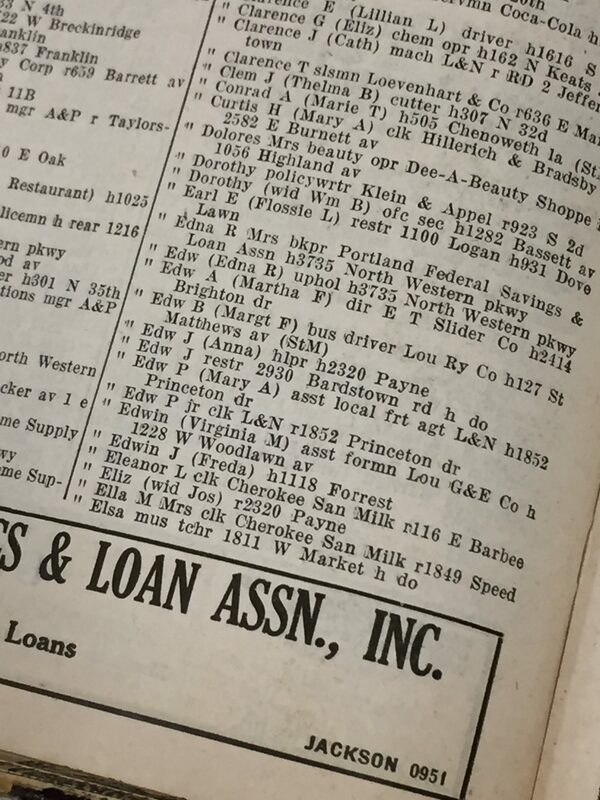 Throughout the many decades of their publication, advertisements can be found each year in the local newspapers, announcing the availability of a new City Directory – obviously offering said directory for sale, or better yet, offering subscriptions to the yearly updates. The popularity of these directories also drove sales for large advertisements within them – a pretty lucrative endeavor for the publishers! 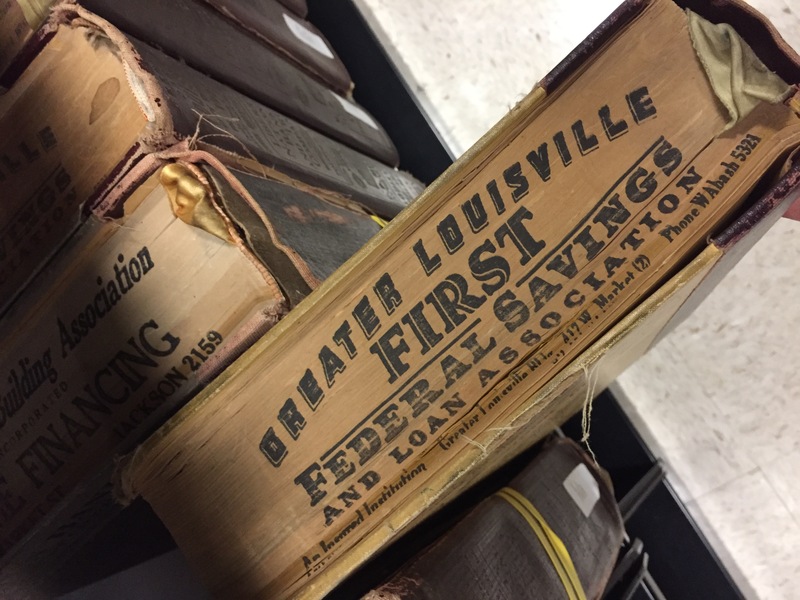 But then I stumbled upon an amazing article published in the Louisville Courier Journal in 1888: Looking for Names – The Experience of a Canvasser for the City Directory. This long article detailed the yearly process: from hiring the canvassers, to the questions they ask, to the people they seek for information…despite the horrible prejudices exhibited in this article (many racially disturbing descriptions) we can learn a lot from the description of the canvassing process. Canvassers were hired to begin work in the fall of each year. Each large city required a canvassing force that was 25-30 men strong – a hard choice as the applicant numbers ran into the 250-300 range! Obviously, the ideal candidates possessed advanced reading and writing skills (according to the article). Instead of a large book of sheets like the census enumerator might have carried, the City Directory canvassers carried around strips of paper to gather the information on each person employed in any type of occupation. One strip of paper for each person. Everyone working an occupation was included in the City Directory – as long as they could be found and counted by a Canvasser. 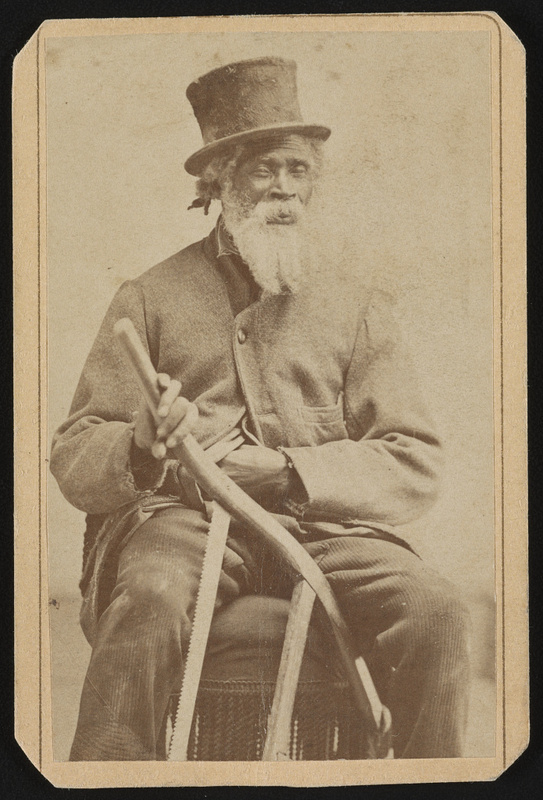 All occupations were sought, both legal and illegal, according to the article (“opium joints” and “gambling rooms”) – how they labeled illegal occupations is beyond me – but it makes me want to take a closer look at the types of occupations listed. Money was NOT a part of the inclusion process, unless a business owner decided to purchase a prominent advertisement (or large/bold font) in the Directory. Canvassing took place from around 7am to 6pm. Much like the census taking process, the city was divided into districts and assigned to individual Canvassers. 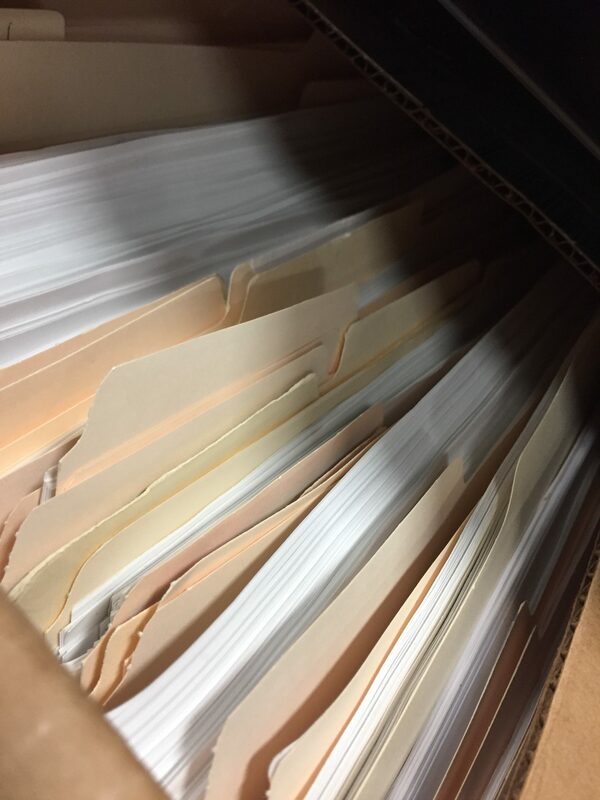 If a Canvasser was good at his job, he might be employed throughout the year to assist with the production of the Directory, through the publishing process – but for the most part, canvassing work was grueling with low pay, resulting in heavy turnover each year. 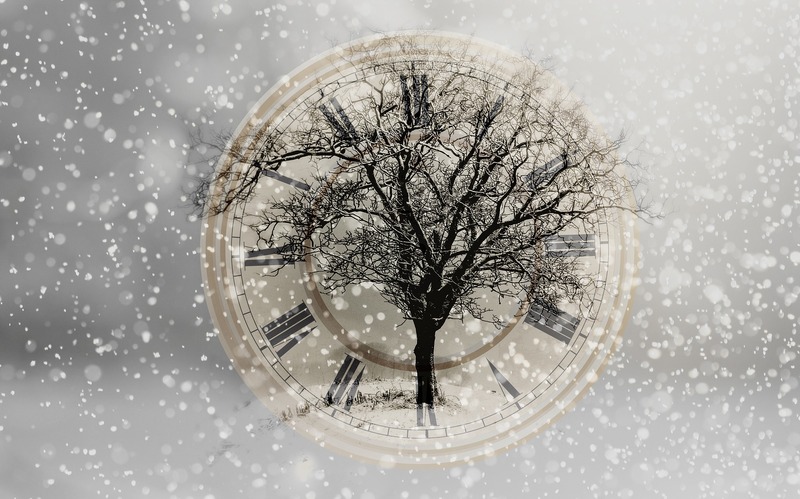 Sometimes, our ancestors did not want to be recorded – as it is noted in this article, those who were running from creditors, or the law, or involved in illegal activities might give an alias – just our research luck! Confusion was rampant throughout the canvassing process – heavy accents and ethnically diverse names meant misspelled or phonetically butchered entries. As large cities were immigration hubs, many of our immigrant ancestors might have been overlooked by the Canvasser – or they may be there – just be sure to look for any possible pronunciation. 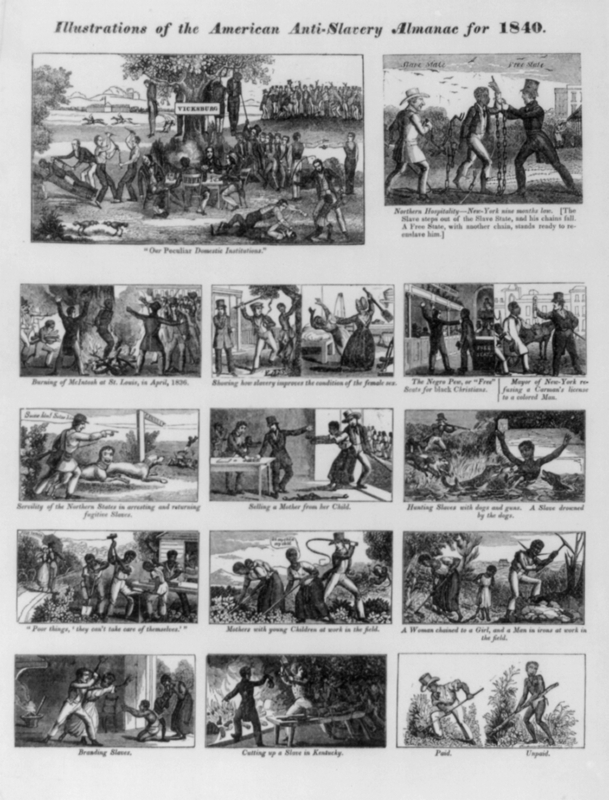 The African American community was represented in an anecdotal story that demonstrates the precarious relationship between anyone of authority and this population group. 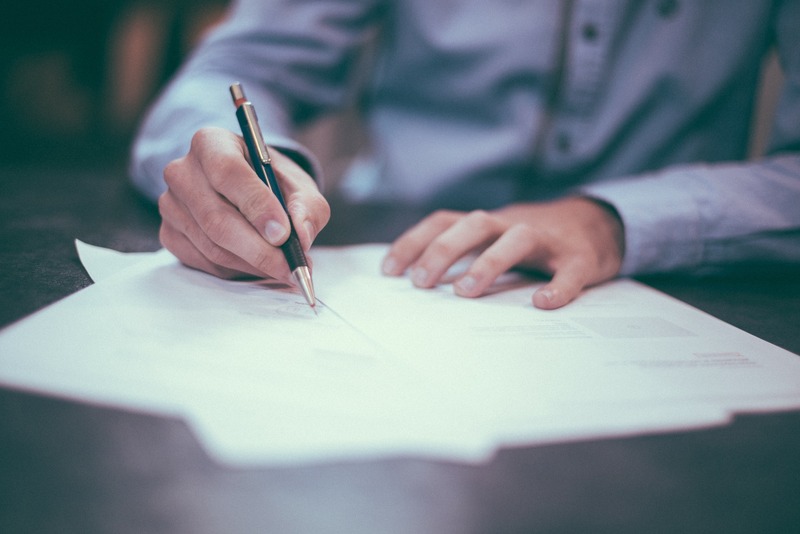 The Canvasser complained that they were perceived as government officials and, therefore, false or reverse names were given with each subsequent year. The example given was “Andrew Jackson” given one year and “Jackson Andrew” given the next year. It was even noted that they suspected it was a list being compiled for police use. 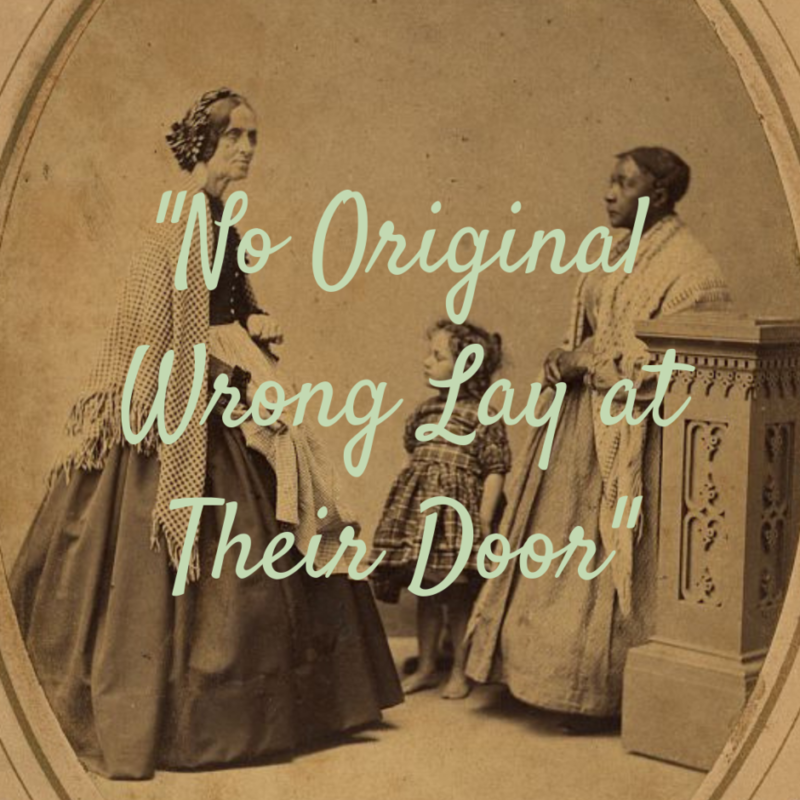 The Canvassers also complained that many women were not included in the Directory because many believed women performing any occupation was a sign of low class status – resulting in a refusal to admit any occupation at all – regardless of the report of neighbors. 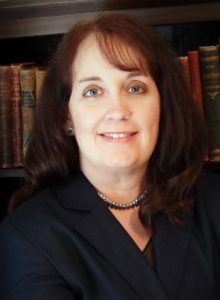 One of my favorite stories from this article came from a household of just women: a single mother/widow – who happened to be a business owner. The household was wealthy enough to employ servants – thereby creating a brief period of confusion. The woman’s young adult daughters were of no occupation, and spent their days at home attended by the servants. 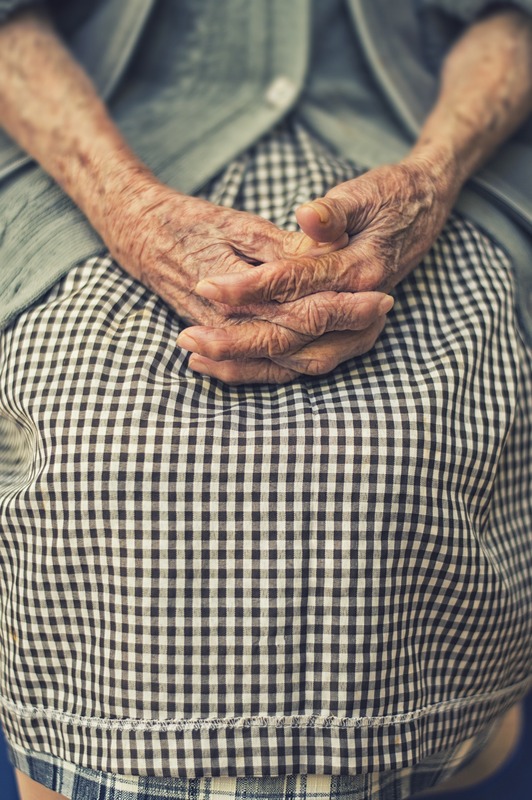 The Canvasser arrived and asked about the head of the household and her occupation/business, and then asked about other residents in the home – inquiring about their profession. After first denying their mother’s occupation, the young women thought the City Directory was something of importance at first, and pressed the man to include their names. When they realized that he kept focusing on occupations they became even more offended, declaring that they were NOT of any occupation! 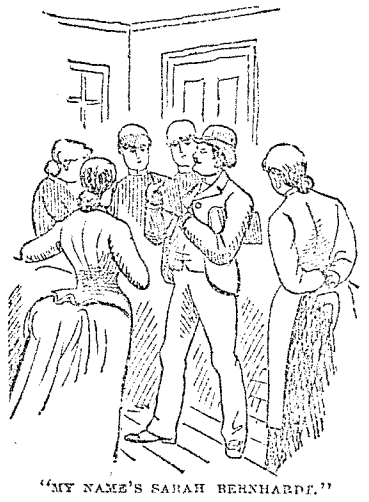 The Canvasser then focused on their servants to add to the Directory – which offended the girls even more – apparently, their mother was a large purchaser in the southern region, but the fact had been hidden from their neighbors and social circle as this was considered to be a low class activity. Due to his experience that day, the Canvasser changed his entry for the mother to list “purchasing agent” as a matter of revenge. 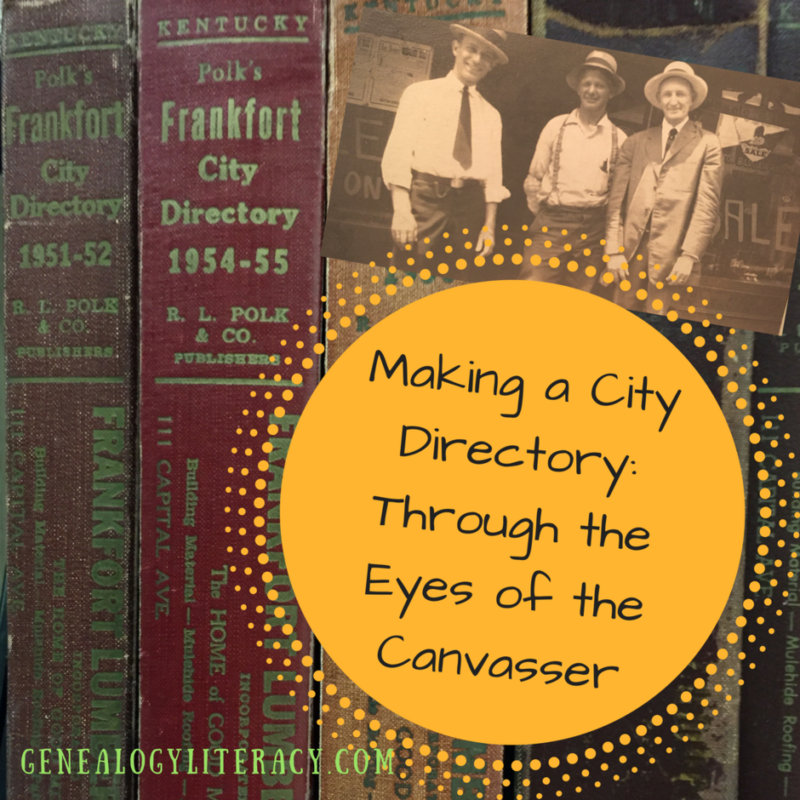 After reading this article and its portrayal of the difficulties of canvassing, I can safely say, count yourself fortunate if your ancestor was listed in a City Directory. 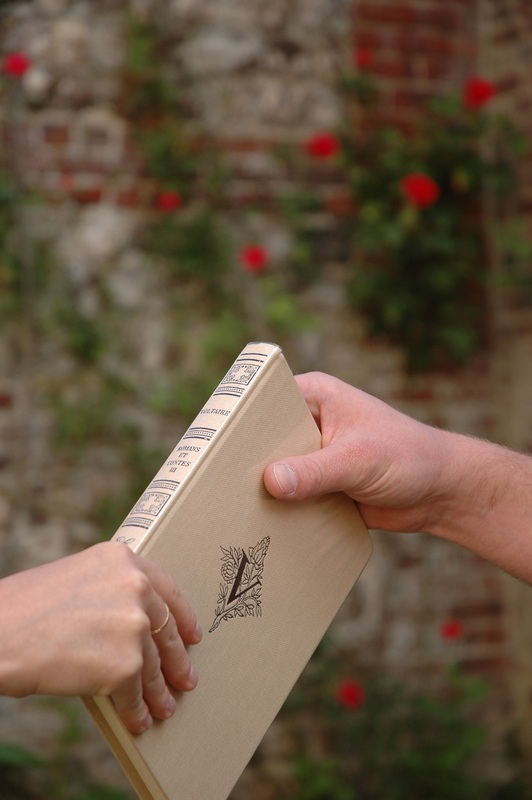 But also, much like the tax lists, it’s important to look through many consistent years of Directories – simply because our ancestors were mobile, and maybe away visiting with family to miss the Canvasser – present five years, missing for two, and then back again. Plus, note if your ancestor was a day laborer, or first generation immigrant, or one of the many disenfranchised classes of the time. For all of these groups, they may have been excluded from the City Directories, or merely listed with altered names – just because the Directories are typed, doesn’t mean the errors are any less extreme than the errors we are used to seeing in the census records. Understanding the context of your family’s place in history, and their social/racial/cultural challenges can help with your research and analysis strategies!